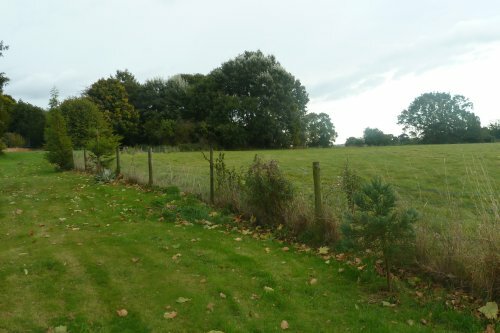 I moved to Aston Abbotts in Buckinghamshire in March 2003 and was able to purchase the field and adjoining amenity land at the back of my house. 'Amenity land' is estate agent speak for land with no agricultural value. It's a 4 acre hollow in the ground that acts as a sump for all the ground water from the adjoining fields. 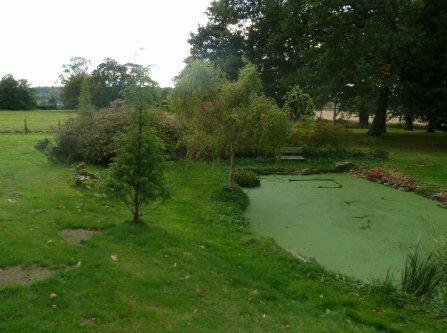 A previous owner, some 30-40 years ago was a keen fisherman and he had three interconnected ponds constructed, and carried out some Capability style planting. 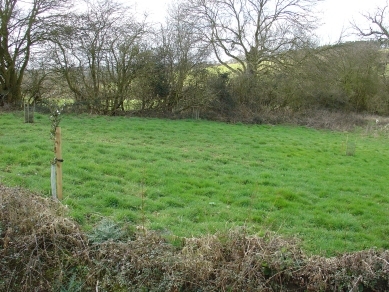 The land has been neglected for many years and was completely overgrown with nettles and brambles the size of trees. An impenetrable jungle. 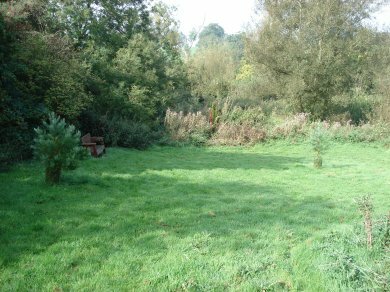 In November 2004 the ground was cleared of vegetation and the ponds, which were choked with rushes and flags, were dredged. This work revealed a wonderful natural garden with stands of willows, sweet chestnuts, oak, cherry and maples. April 2006 I flail the grass expanses to control the nettles and brambles, and some of the trees have been tidied - otherwise it's as nature intended. As you can imagine it's a haven of wild life and I feel privileged to be the custodian of this wild garden. I have always had a fascination for Sequoias and those photos of tunnels through huge trees. I now have the opportunity to plant some of my own. 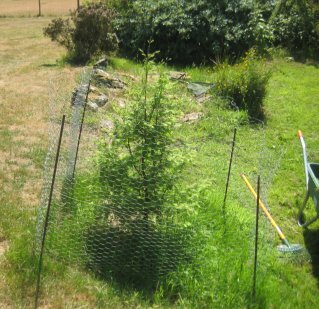 Being 60 years old I will not see them in all their grandeur but it is with a lot of satisfaction that I have planted a line of Dawn Redwoods, a triangle of Sequoia and a lone Coast Redwood. I will watch their progress with interest and trust the next custodian will appreciate them as much as I do. Thank you John, what a fantastic project you have under way. I am sure this is a dream to which many aspire. There must be other people with a similar story to tell, hopefully some will get in touch and allow us to publish their accounts and record their trees. John kindly allowed us to visit and measure all his trees in September 2008 and, as you can see, they are all doing really well. His wild field is really beginning to take shape. December 2009 In December 2009, John wrote to say, "the snow is fantastic - trees are getting a bit bowed down but I'm sure they can cope." Thank you for the photograph John. Your field (although I am not sure it can still be called a field after four years of planting and tending), must look like a winter grotto in the snow. Yes, the Redwoods take the cold weather in their stride. The future progress of John's Redwoods can be seen in the Locations section. July 2018 We have only recently learnt the sad news that John died in 2016. It was our pleasure to have first met him in 2005 at a service station on the M25 when he picked up some saplings to begin his collection of Redwoods. One of the nicest fellows you could meet and happily he went on to fullfill his wish of creating a haven for his trees and wildlife as a legacy for future generations. It was an honour to have known him. My wife Griselda and I were married at the end of 1991, both at the age of 60. During our honeymoon in January 1992, we visited Muir Woods near San Francisco and bought a piece of a Sequoia sempervirens from the information centre. It was a flattish dome shape about 10cm across called a "burl", comprising a piece of the bark with wood attached. They also provided instructions for growing it. I understand that burls grow at the foot of the trunk and their natural function is to regrow should the tree be burnt down. Anyway, we kept it sitting on a saucer of water as instructed; on the windowsill of a north facing bedroom for about a year. After many months, it threw up about 10 shoots. When the biggest were about 3cm tall I rubbed out all but the two strongest and later, when about double this height, I selected just one of them and planted the whole burl in a wide plant pot and stood it in the garden, watering it regularly. After several more months, when it was about 25cm tall, I planted it out in its permanent site at the end of our garden where it backs onto woods and where it was quite heavily shaded in summer but only lightly so in winter. The planting out must have been in the early spring of 1994. Now, almost 12 years later, it is about 7.5 metres tall and its trunk has a girth of 60cm (20cm above the ground). At this rate of growth it will have reached the height of a neighbouring sycamore in another 12 years! Thank you Jim - what a lovely story. It is interesting that Coast Redwoods can sprout from these burls. They also seem to reproduce relatively easily from cuttings, unlike the Giant Redwoods. We can see from the photograph that it is doing really well. 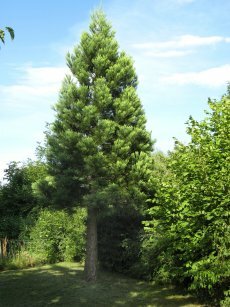 My interest in Sequoiadendrons (or Big Trees as I think of them) dates back to the 1960s, when we lived in Sandhurst Road, Tunbridge Wells. 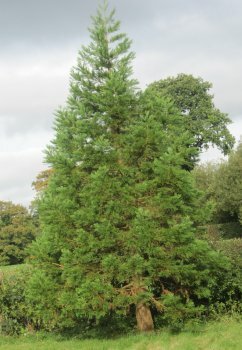 On visits to a school friend who lived at the top of what was then a new road nearby called Springhead, I greatly admired two fine large specimens, one on each side of a road of a similar vintage near their house, actually called "Cedar Ridge", presumably in honour of the two Sequoiadendrons. I was fascinated by these giant trees and determined to plant my own little grove of them if I ever got the chance. Unfortunately, although the trees are still there, and one still looks vigorous, the other is now in a very sorry state - see recent pictures, one taken by my father on a visit to a friend who lives nearby and also admires the trees. In 1991, following the cot death of my sister Damaris' son Jack and other sad events including the death of my grandmother, my mother Brenda bought about 3 acres of land in the Welsh countryside, on which (as part of the "International Peace Forest") she has since created a new woodland. This she has named "Jacks' Wood", in memory of my nephew and of an old gentleman, also named Jack, who during his lifetime owned this and the surrounding land, extending to about 50 acres. Several friends of the family have plots in this area, which they have planted up with various trees, reflecting their own diverse interests. The chance to plant my own trees came when, in 1992, my wife Karin and I, with help from my mother, acquired a smaller wood of about an acre, just along the track from Jacks' Wood. Damaris had heard of this becoming available and encouraged us to buy it. 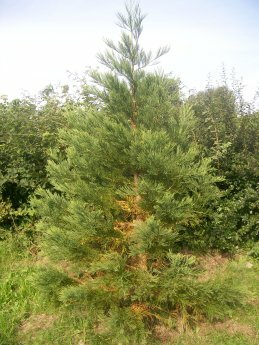 In November 1992, Damaris and friends planted my first three Sequoiadendrons, which I bought from Starborough Nursery near Edenbridge, Kent. Then in May 1993, on my own first visit, I planted another two, also bought from the same nursery. All five were, like Jacks' Wood, later registered as part of the International Peace Forest. 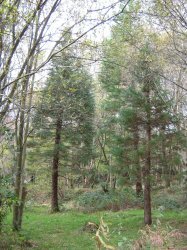 I have also renamed the part of our land on which the Sequoiadendrons are growing "Big Tree Land". The rest of the land is given over more to native woodland with glades with native wildflowers (some of which we have planted ourselves) and we jokingly call it "The Bog", although in fact the area where the Sequoiadendrons are growing is rather boggier and there is even a "seasonal" stream and pond in that area. By far the tallest tree is the one growing right by the stream, and they all seem to relish the location and plentiful supply of water. October 1997 Finally, in May 1997, my mother planted the sixth Sequoiadendron on our land. This is now about 2 metres tall, but at that time it was still quite small, being a seedling from a batch of pre-germinated seed I had bought from Norfields and sown in 1994, growing them on at home in Kent. I had previously attempted to establish some of them in Jacks' Wood, but with less success. Perhaps the conditions there were simply too harsh - our land is relatively sheltered and was already quite well wooded even when we bought it, while the other land was originally just an empty field on a very exposed Welsh hillside, although now, after 15 years, looking much more like a "real" wood. However, I am pleased to say that one solitary Sequoiadendron from this same batch of seeds does still flourish in the very depths of Jacks' Wood. I planted this there in November 1996 and, as of June 2006, it was approaching 3 metres in height and looking in excellent condition, actually rather better than those on Big Tree Land. Unfortunately, in recent years, a number of native trees (mainly birches and willows) had rather taken over Big Tree Land and crowded out the Sequoiadendrons. Some were cut down early in 2005 by our friend Nigel, which was a great help. 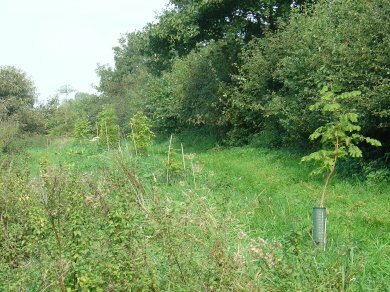 Then in June 2006, I was able to make a brief visit and cut back more of these birches and willows (fortunately there are still many more left on our land as a whole, together with hazels, oaks, hawthorns, beeches and many other "native" trees, providing a real haven for wildlife). 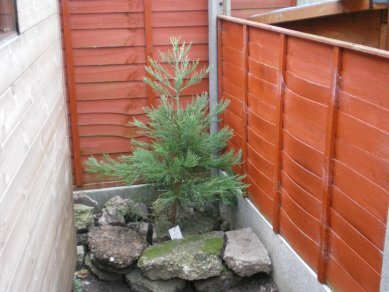 This encroachment was a problem which I did not anticipate when planting the Sequoiadendrons - I did allow what I thought plenty of space between them, but I had not taken into account these equally vigorous native trees, which clearly had other ideas! Heights are estimates. Girth was measured at 1m from ground. Thank you Matthew - another excellent project with six trees that will no doubt eventually become a local landmark. The crowding by other trees is always a problem when the very best shape is sought from our specimen trees. Whatever happens, though, in time the Giant Redwoods will win out because they will just keep growing upward, leaving the rest way behind! A marvellous story from a great enthusiast. 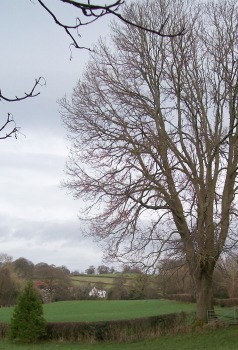 Matthew sent an update of measurements and a photograph of some of the trees in late 2010. Matthew says, "The photo shows Trees "2" (on left), "3" (in middle at back - by far the largest) and "1" (on right), as of Oct 28 2010. This looks rather similar to the one from June 2006, the same combination of trees and you can even see the same stump, of a willow, in the centre foreground of each of these pictures. The ground in much of this whole area was originally quite boggy and the grass very coarse, long and tussocky when the trees were planted - as can be seen quite clearly even from the pictures taken in 1993-1997 but the Sequoiadendrons now seem to have dried it out and created their own "lawn", with no mowing required. It looks very attractive, and the trees are looking better although still suffering rather from the after-effects of the previous overcrowding by native trees. Unfortunately the largest ("Tree 3" - at the back, in the middle, in the picture), because of having been so overshadowed by other trees, has few or no branches on one side, up to perhaps 11 metres from the ground. 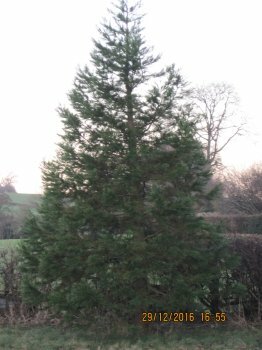 It does though have an interesting, tall and straight trunk - looks almost more like a Coast Redwood than a Sequoiadendron! Each of the trees definitely has its own character, so I am happy with the way they are all developing, each of them very much an individual. Your trees are all doing very well, and the photograph showing the trees from the same angle as 2006 illustrates how much they have grown. What does it feel like to have grown a 12m Giant?! It sounds like the Sequoiadendrons have been loving the boggy ground. I know what you mean about them being individuals, the branches create some amazing different shapes. 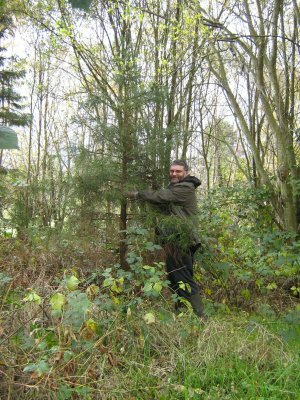 Matthew visited his trees in October 2011 and sent updated measurements and photographs. He says, The smallest of them, which I grew myself from pre-germinated seed, had sadly died. I left it in place for possible use by any wildlife and took final photos and measurements just the same. In the photo there is a yellow tape measure opened to 2 metres and resting against the trunk of the tree to aid in estimating its height. All heights, except that of "Tree 5", were only very roughly estimated; all girths though were measured, at 1 metre above ground. It may be the last time I will attempt to estimate the heights of the remaining trees, as this is getting harder to do (let alone take good full photographs). Thank you for the measurement and photographs of your Redwoods, it's great to hear from you with updates. What a shame about your Tree No. 5, perhaps you hugged it a little too hard last year! Seriously though, it is very disappointing when this happens, especially to a tree you have nurtured from a seed. This is one of the reasons I just have to keep growing them, knowing I will inevitably lose some. If you decide to invest in a clinometer you could continue measuring the heights for many many years to come as you just have to be able to see the top of the tree and a part of the trunk. In any case, if you still want to let me have just the girth measurements I am very happy to continue to update your table. Alex Lewis - July 2006 Alex is a 19-year-old student studying Arboriculture and he is growing Giant Redwoods to turn into bonsai specimens. I have only recently become interested in the tree world and with this I developed my love of Redwoods. These trees are the longest living in the world and they are just amazing. With my fascination for trees, I have enjoyed the art of Bonsai and I wondered how it would look to have the largest tree in the world growing as a bonsai. 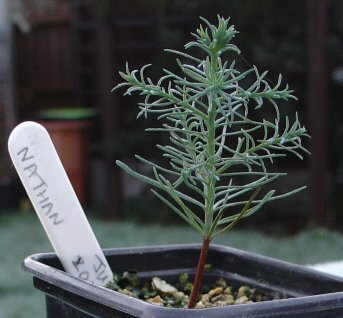 I bought some Sequoiadendron giganteum (wellingtonia) seeds from Nickys Nurseries about a year and a half ago and, after following the advice sent with the seeds, have managed to geminate 9 from a batch of 30. The best one is now 15cm height with a girth of about 8mm. First of all I planted the seeds in a seed tray, covered them and left them outside for a while. Once they started to germinate I planted them into smallish pots. 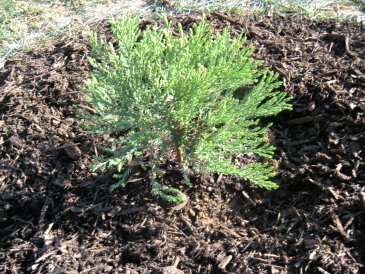 Before Spring this year I planted my best redwood in a small bed, (using normal compost), that already has a variety of my other trees growing. I will wait a few years before I bonsai this one, as I want the tree to have a more substantial diameter and more height in order to get the dimensions correct. I still have the remaining trees potted and I am waiting for some space to be freed up in the garden before planting them. Thank you Alex, it is so nice to hear of young people interested in trees and Redwoods in particular! 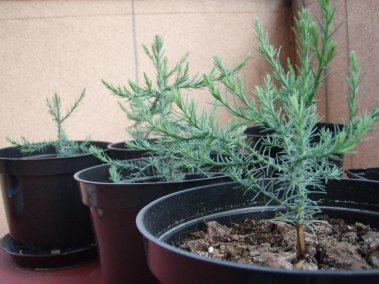 Your miniature Redwood forest will be a lovely sight in future years. Good luck with all your efforts. June 2006 We believe we bought this tree in about 1990 from a nursery next to the restaurant at Loch Fyne in Scotland. We kept it in its pot until we moved to our present house in Barrowby, Lincolnshire. My wife planted it in November 1994 when it was eighteen inches high. In 1998 the growing tip was mysteriously broken but it hardly faltered and is now magnificent. Measuring it as accurately as we can it seems to be approximately ten and a half metres high. I love this tree and it is a pleasure to look at when covered in snow or it has the wind blowing through its branches. 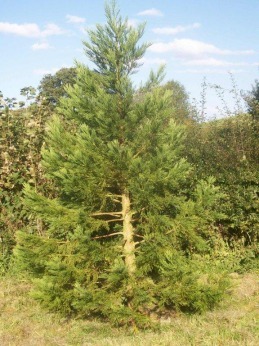 Thank you John, and pleased that we could finally identify your lovely tree as a Coast Redwood, after you sent a photograph of the foliage and cone. We hope your tree will continue to give much pleasure as you spend many enjoyable times, with a cold beer, just watching it through the seasons. October 2006 My interest in trees begun when I was a boy and my parents took me to the Bedgebury Pineatum where I first saw a redwood and I've liked them ever since. I've been to Bedgebury many times since I was a kid and have learned a fair amount about the forests around the world and I was shocked to learn that, of the old redwood groves that once stood a hundred years ago, only 5 percent of them remain. So I decided to plant a couple of coast redwoods as they are less common than the giant redwoods, in homage to those trees that no longer exist. 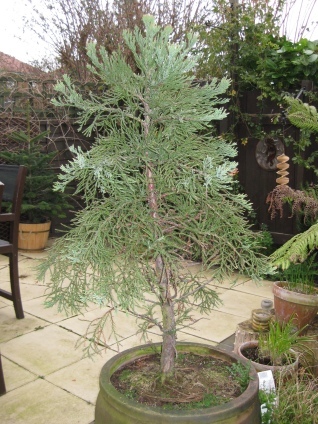 When I decided to buy the trees I couldn't get them anywhere through the usual garden centres and was refered to a tree specialist near Ashford. The previous owner of the garden (tree centre) had left and most of the trees had become potbound so the new owner decided to cut them. That was last year and I bought them about 3 months ago. The garden centre said they are both about 10 years old. They have produced about 4 leaders from the cut stump and I intend to let them grow and then cut to leave one leader. Thank you John, it sounds like you will have a grand collection of trees and the pictures show they are growing well. Nathan - November 2006 Nathan is 8 years old and has grown some Coast and Giant Redwood from seed. He very kindly sent us these entries from his growth diary. 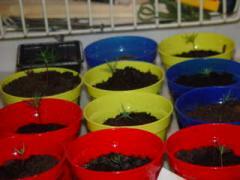 26th October Today I planted my Coast Redwood seeds. I had five seeds and I planted them in two pots. I scarified them with a nail file first. 11th November When checking my seeds I noticed a small root under a clump of soil. I was very excited when I saw this. 19th November Yesterday I discovered a small green thing with a brown thing at the top I suspect it is the seed coat. 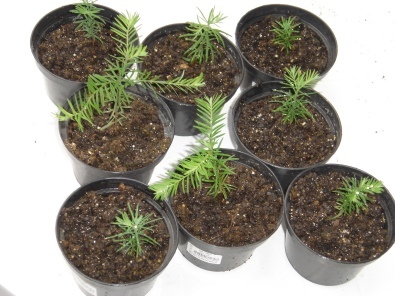 I now believe they are Coastal Redwood (Sequoia Sempervirnes). 22nd November I was going to write what I saw last night but I checked the trees this morning, one has two needles the other still has it's seedcase on I might pinch it off. 23rd November I checked both seedlings, the seedcases just wouldn't fall off so I gave it a little pinch, it came off. 24th November Today I took the Redwoods out of the bag and put them both on the windowsill. The one I took the seedcase from has now got 3 needles. 25th November Not much happening today, except from the two needles opened up which were closed yesterday. 26th November I had to put a cocktail stick in as a cane. From now on I will only post major updates they seem to have stopped growing for now. 6th December My redwoods have caught a fungi disease called damping out they will probaly die. 9th December My redwoods died of damping off. 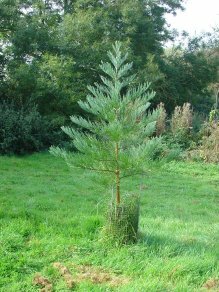 Thank you Nathan, what a fantastic record of the germination of your Redwood trees, and what a great shame that they have succumbed to the dreaded damping off. They had sprouted very quickly, so it seemed that you are doing all the right things, but they can be very delicate at that stage. It sounds as though you have just been unlucky, but it is possible that they might need a little less watering next time. One thing which might help prevent the damping off is to use a teaspoon of Cheshunt compound per half pint of water on the first watering. This is not a nice substance to use, so it would be best to have a parent do this for you. Hopefully your next batch of seedlings will get past this tricky stage and we are really looking forward to an update of your journal in the future. 15th December I have bought 25 seeds which arrived today I will plant them soon. 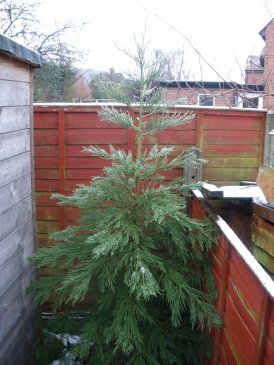 28th December Yesterday one of giant sequoias sprouted it has many little needles. I am really glad you have tried again Nathan, good luck and let us know how they get on. 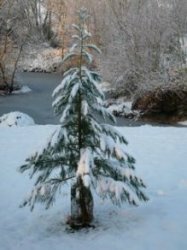 Thank you very much for the Redwood Christmas card - Merry Christmas to you too and a Happy Redwood-growing New Year! 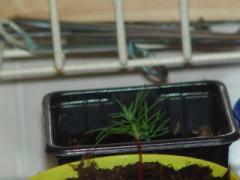 4th January Today I discovered another small giant sequoia seedling. The other one has unfolded its needles. This time I'm going to keep them in the bag longer. 17th February Sadly my last two redwoods died of the same disease. I'll try again at spring. 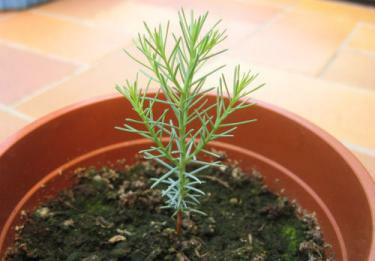 1st April I have decided to try again to grow a giant sequoia tree now its spring. 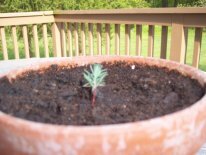 Today I woke up to discover a small seedling of my giant sequoia I was again very excited about this again I hope this seedling will live. Also I have planted some coastal redwood seeds in my greenhouse so fingers crossed they will work this time. Today I spotted two seedlings I think they are giant sequoia. I spotted two reddish loops I think they are giant sequoia. Nathan sent me a handful of seeds that he had gathered, and from them this lovely Giant Redwood is growing. December 2006 I'm 23 studying Arboriculture in Lancashire and became interested in redwoods partly due to reading your website which is brilliant. I particuarly like the 'Tall Tales' section. I recently bought a lot of different variety's of seeds to plant my own trees as a personal project and for fun as our family has some land so I am hoping to create my own forest with redwoods as the kings! I have never done any type of growing before and we haven't covered it on my course thus far so i was bound to make a mistakes which I did pretty much straight up, I hurried into sowing the seeds on 9th December without any pre treatment such as soaking or cold storage These included packets of Giant and Coast redwood. Only after I did this did I do more research and find out how much pre treatment was needed. 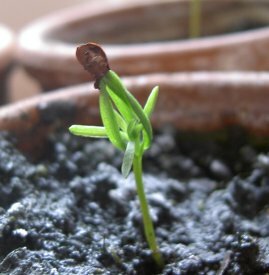 I was pleasantly suprised to notice some of my seeds germinate, Scots pine first up, very healthy number of them as well! I heard how long it would take and with the stories of very low germination rate I didn't hold up much hope for the seqouias but today I was happy to see 1 of the giant redwood seeds germinating. Recently I decided to buy some saplings off the internet in case mine didn't work. I also bought some new redwood seeds and will be putting them through the works. I have already soaked them for 2 days and are now in 'pre-chilling' for a number of weeks before I sow them. Hopefully they will be succesful. Thank you Nick, in your second email you mentioned about the germinating giant redwoods; "there are a couple more but they look a bit red, not green and healthy." This is fine, the seedling starts as a red loop that gradually uncurls before the seed case falls off, revealing four (or in some cases, three or five) tiny green branches. We could have no better accolade than having been a part of your initial interest in redwoods. Good luck with all your seeds and saplings, and let us know how they fare. 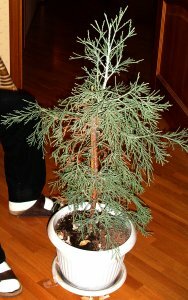 April 2007 ..As for my own Redwood growing my last batch died, probably to over watering.. They all seemed to grow to about 1-2 inches then curl over and die. With my most recent batch I have had limited germination compared to the first batch in January. The first 2 that germinated died possibly due to the dreaded over watering and now I have 3 more sprouted which I am really keeping as water-less as possible without killing them and hopefully at least 1 will survive.. if none survive maybe I'm not cut out for growing my own from seed! 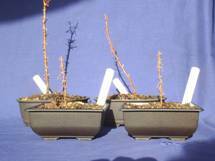 I sympathise about the watering difficulty, I also lost many seedlings in this way when I started growing Redwoods. I found that it helped to grow them in pots sitting in small saucers, and water mostly from the base. The use of cheshunt compound may also help. Don't give up! 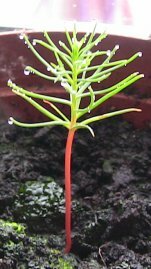 I have 46 Coast redwood seeds that have germinated so far but I am struggling with the Giants - have had three germinate but lost them all within 3 weeks. 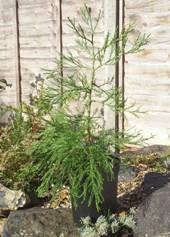 I have just got a new batch of Giant Redwood seed from Nickys Nursery. I will hold onto these until spring as you suggested and try germinating half indoors and half in my miniature greenhouse. Thank you Gareth, I am afraid your "trials and tribulations" are fairly typical of Redwood growing in our experience. I believe most of the losses are due to over-watering. It is tempting to make the compost as damp as you would for flower seedlings but this is a mistake. Naturally, the survivors will eventually be well worth all your efforts. Thank you also for your queries about growing and tending seedlings, we will be using some of our answers to update the growing page soon. Good luck with next batch of seeds and do keep us posted with your updates. April 2007 Have had much better success with my second sowings of all three species (Giant and Coast Redwoods and Scots Pine) I now realise the BIG mistake I made was putting the original lot in direct sunlight, they obviously don't tolerate it at all well. Have just pricked out a load and potted them on so will hold thumbs that they do ok. Thank you for the update Gareth, it is good to hear (and see) that your young trees are doing well, it really is a question of perserverance. The photographs show the subtle differences between Giant & Coast in the very early stages of development. The Giant has thin spindly needles, whereas the foliage of the Coast is more flattened and broader. You should also find that the Coast seedling grows at a much faster rate. 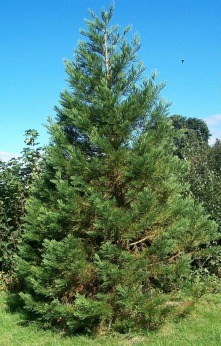 The Scots Pines are also doing well. April 2016 I've not updated in years and the site sprang to mind again when looking up info on the cold stratification process. Thought I'd send you a quick pic of one of my "grown up" saplings. I've planted a number of these out in the countryside and they all seem to be thriving. It's great to hear from you again and I'm so pleased your trees are doing well and that you're helping to increase the number of Redwoods being planted in the U.K. 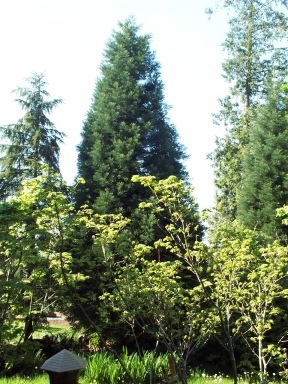 I have two dawn redwoods, one 28 years old and about 40 ft high and the other only 4 years old and of the golden form. I planted both - the first one in 1979 and the second in 2003. 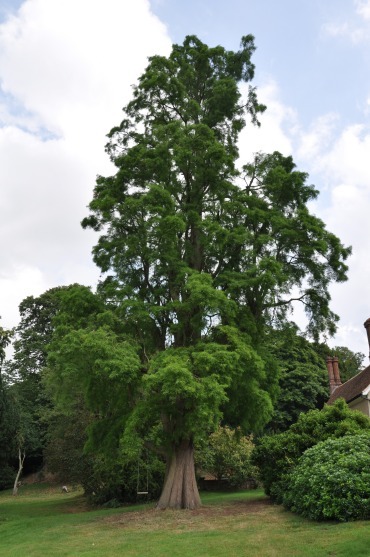 The Dawn Redwood which has been in for 28 years has this year for the first time produced cones. And, surprisingly, the Golden form Dawn Redwood which has only been in for four years, has this year also produced cones. Can anyone explain? Thank you Guy, both the Dawn Redwoods look to be in good health, the older one already taking on that classic conical shape. I must say I was amazed to see that a very young tree of mine (a Giant Redwood in this instance) produced a cone when it was around two or three years old. If anyone can offer an explanation I would also be interested to hear from them. Tim - June 2007 Tim has a web site showing Giant Sequoia in Belgium and Holland : Mammoetbomen in België en Nederland. There is also a UK gallery. Some good news on my single seedling: my little giant redwood has not grown much for months but the last weeks it finally started growing quite considerably. See the photo I took last week. Anyway, I'm not giving up and try to collect some new seeds from that tree this summer (I do not want to buy seeds, 'cause I like to "know" the parent tree you see). Thanks Tim for permission to use your photographs here. I quite understand your eagerness and satisfaction of growing from trees that you "know". I have had around about the same success rate as yourself but the one or two that have survived are quite special. Good luck with your seedlings! July 2007 Remember I sowed some giant redwood seeds a couple of weeks ago from that same Belgian tree? I feared I might had fried the seeds by putting a glass plate on them. 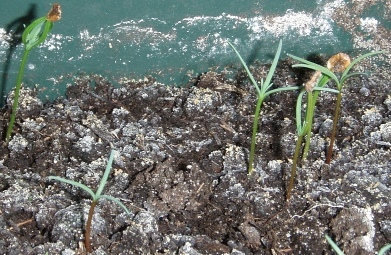 Well, already 4 giant redwoods have germinated since then, which brings the total to: 7 out of 200 germinated. Not bad for self gathered seeds, I suppose! Very well done Tim, on your 7 out of 200, it is a very good propagation rate for self-gathered seeds in Europe. I hope they continue to do well and I look forward to receiving some more photographs as they grow. Caryle - June 2007 Caryle is 11 years old and has grown some Giant Redwood from seed. He very kindly told us about his germination successes. I am writing to tell you that I have started 18 Giant redwoods. The first three I grew were ones that I bought in Miur Woods (America). I was going to buy a coastal redwood seed, but my Dad encouraged me to buy the Giant redwood. Anyway, I planted my 8 seeds at the end of February 2007. In March, I saw a plant in my pot. It had a red stem, with four green prongs on the top. I was very excited when I saw this. I rushed to my Dad and told him. He came to see. I looked at the pot again, with Dad. "Is that another one I see" I said I saw a second one "And there's another one" said my Dad. It couldn't be true. 3 out of the 8 seeds germinated. Too bad I didn't get to see when the loop came poking out of the soil. The other 15 were from 35 seeds I bought at Kew Gardens before Christmas. I sowed the seeds after I saw the three in March. At the end of April, I saw two loops poking out of the soil. the next day, three more were poking out of the soil and that evening, another one poked out two days later after that, four more were poking out, and the first two had already straightened out. The next week, another one poked out, and all the others had straightened and had four prongs. Three days later the other four poked out. All were all cramped in one very small pot, so I separated them a week later. Thank you Caryle, it is so very rewarding when those first red loops appear and your seedlings look like they are doing well. Remember go easy with the watering and you should have a fine clutch of trees. Tom - July 2007 Tom originally wrote in April this year asking for tips about germinating Coast Redwood seeds from cones he gathered at Westonbirt Arboretum in Gloucestershire last summer. Since then he has had successes with seeds from Chiltern seeds. April 2007 I bought some seeds from Chiltern seeds and have germinated 3 so far. I would estimate that I have planted about 120 seeds, so there are almost definately more to come. They've been planted for about 1-2 weeks and one is about an inch high with the seed case still on its head, the other two are barely out of the ground and I can't see whether or not the seed case is still attached. Should I take the case off the top of the redwood? I think it might be stopping the needles from spreading out. It is a difficult one to decide upon. I generally leave them three or four days, or possibly a week, to see if it drops off naturally. If not, I will very gently pull it off. To do this I tend to hold the leaves in the forefinger and thumb of my left hand (being right handed), squeeze the seed case gently from the edges to open them a little, and then carefully pull. It is important not to pull on the base of the stem as they do not like disturbance to their roots. Sometimes the leaves snap but this is a chance you have to take, otherwise the seedling may shrivel and die. Having sown 120, you should have the opportunity to experiment a little. July 2007 Several redwoods have come up through the soil now. One, I noticed had three needles. I thought this might be just on the first set of needles, but now the second set are starting to open up and I saw they have three needles as well. It must have different genes from the others or something. I have a deformed redwood! COOL! Have you ever seen anything like this? Thank you Tom, that is great news about more redwoods germinating. I too was very surprised to see three-prong redwoods myself, and I have also had five-prongs, although they did not appear to look any different once they had grown a little bigger. 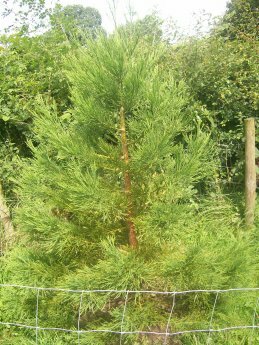 Iain sent a photograph of the Giant Redwood that "you gave last year now planted out in my parents field in north wales." Thank you Iain, it was good to hear (and see) that the tree is doing well and I look forward to future updates on its progress. The tree appears to be doing well and has put on a lot of growth when I compare it with the picture I sent you in 2007. 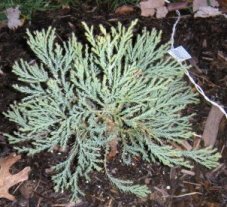 I have heard and tried to grow dawn redwoods from hardwood cuttings not that successfully. I took the cuttings from large trees from lateral branches in the winter. The redwood cuttings being about 3mm thick and 6 to 9 inches long, however they do not grow strongly at all. Can you please give advice on cuttings for dawn redwoods as they are supposed to be quite easy to propagate this way? Thanks for the update Iain, it certainly looks happy in its Welsh home. Thanks also for the photograph of your very nice Dawn Redwood and, incidently, I didn't appreciate the excellent fence(s) from the 2007 photograph! 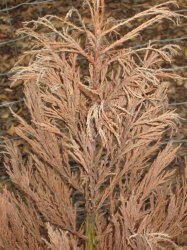 With regard to the Dawn Redwood cuttings, I have no experience in using this method, in fact I have not propagated any Dawns although I may start experimenting in the spring... You could try a dab of hormone rooting powder. John used a stick-a-piece-in-the-ground-and-see method that has appeared to work very well! Thank you for the latest photograph of your Giant Redwood. The tree certainly seems to be thriving and its trunk appears quite a bit thicker than in 2008. Iain says, The fence around the tree has been removed as the tree was starting to touch the fence. 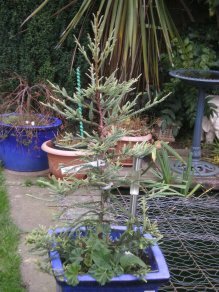 Another good year for your Giant Redwood, it is certainly beginning to rocket upwards (and outwards), thank you for the update and photograph. 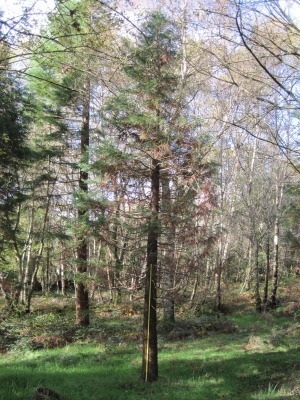 An update on my redwoods, a photo of Giant Redwood taken in September 2011 is attached, as you can see it is doing well. However when I saw the Dawn Redwood variety Goldrush in the summer it seemed weaker, less leaves than other years but now in September it has already lost all its leaves, some are still on the tree but dead/dried out. I do not think this is the normal loss of leaves in the autumn and the young tree maybe dead. I tested some of smaller stems and they were all brittle. The 2010-2011 winter was exceptionally cold I believe down to -19 degrees on occasions in this location and may have something to do with Dawn Redwood's problems? Thank you for the update on your Giant Redwood and the photograph. It's great to be able to show the progress via a photograph each year. I'm really pleased it's doing so well. Sorry to hear about your Dawn Redwood, the best signs of these trees still being alive is tiny buds that should be apparent all over the tree this time of the year. 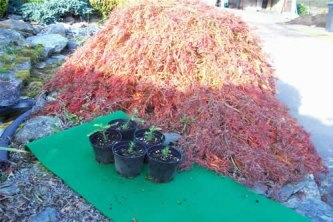 You could try giving it a bit of a feed, and perhaps a deep compost mulch around the root area might help keep the worst of the frost off the roots. I think the cold is a problem, but try the mulch idea and cross your fingers. One final thought though, it could be a lack of water during the summer. They do like to have continuous availability of moisture and I have discovered that when I have under-watered one in a pot, although the leader and top branches die completely, the tree recovers completely and grows a new leader from a little below the dead section. It only takes a week of dryness for this to happen with the potted ones. Please find attached a yearly update photo taken in September 2012 of my Giant Redwood. As you can see the tree has been growing really well. Thank you for this year's update Iain, your Giant Redwood certainly does seem to have taken off now. I wanted to give you an update photo on my giant redwood. As you can see it is doing well. Thank you for the yearly update, your tree is looking fabulous, healthy and growing tall now. It should keep rocketing upwards now and the trunk will thicken up quite rapidly. Here is an updated photo of my Giant Redwood taken in December 2014. The second photo shows the Giant Redwood's position in the field and the large Ash tree on the right, maybe one day it will be as tall or taller than this Ash. 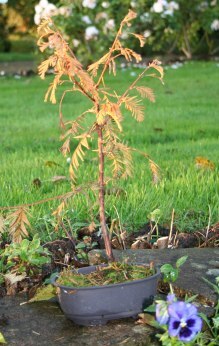 I planted another Dawn Redwood (variety Gold Rush) after the original tree died, possibly due to the exceptionally cold winter and wind. Thank you Iain, it's good to see that the Giant is putting on rapid growth now, it's amazing to look back and see how small it was seven years ago. Yes, barring mishaps, it will no doubt eventually outgrow the Ash tree! I hope you have better luck with your new Dawn Redwood. 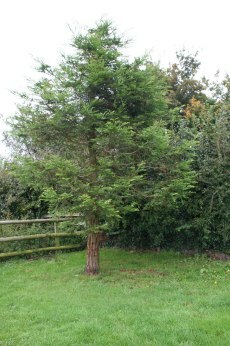 Thank you for the update Iain, your Redwood looks happy in its Welsh home. 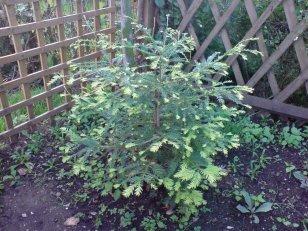 My replacement Dawn Redwood (variety Gold Rush) has few more leaves than in previous years and hopefully it has now become established. I have read that the Gold Rush is slower growing than the common form. It certainly has a lovely leaf colour. 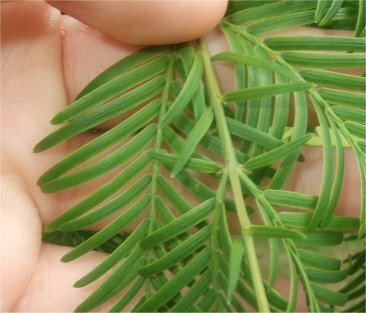 I'm pleased to hear your Dawn Redwood is settling in now, and you're right, it's leaves have a superb colour. 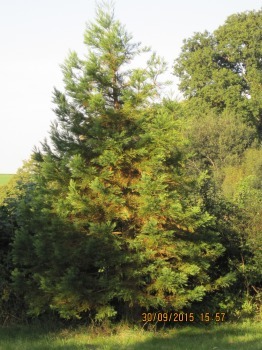 It's hard to believe that it has been ten years since you planted your Giant Redwood in Wales. It's great to see its progress. 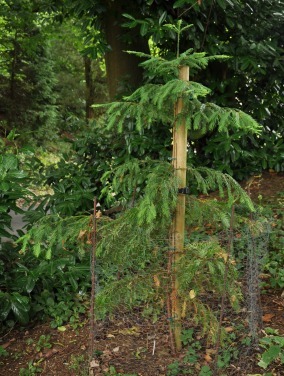 Ralph sent a photograph of his Coast Redwood. 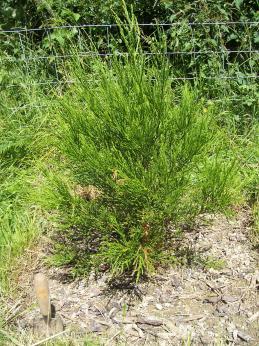 He says This sempervirens is in our paddock down Whitcalls Lane, visible from the public footpath. It is about 15 years old given to us by a friend who returned from California. My wife has a Dawn Redwood Bonsai, but does this count? 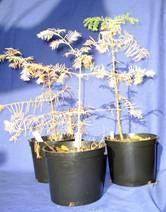 It would be great to have a photograph of your wife's Dawn Redwood Bonsai too as a curio. 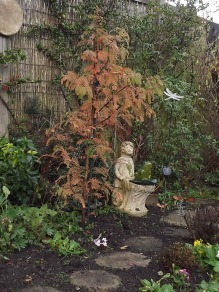 Attached is a photo' of my wife's Dawn Redwood. Unfortunately it's in its winter plumage! I'll update it in the spring. 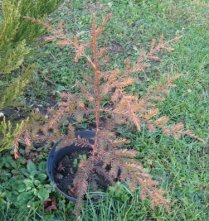 Thank you Ralph, the Coast Redwood is certainly a lovely young specimen and I look forward to the spring picture of your wife's Dawn Redwood. I have been a trained Forester for more than 43 years and trees are a passion of mine. I have been to California to see some of the redwood groves near San Francisco last December. I even managed to collect some seed cones and bring them back, and managed to germinate some. 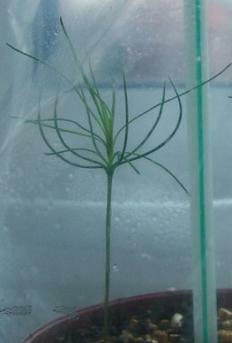 I now have 5 small Coastal Redwood seedlings. Thank you Colin, good luck with your Redwood growing and I look forward to hearing updates in the future. Mark D’Cruz - November 2007 Mark has published detailed Bonsai guides for many species of trees, and he is currently writing a Guide for Redwoods. My adventure with Giant Redwoods was fired by my love for Little Trees - Bonsai. For years now I have been growing different species as Bonsai. I have always wanted to grow Redwoods for Bonsai; however, it was only recently that I decided to give them a try. About 2 years ago, I got my hands on some Redwood seeds from a couple of Online Nurseries. I followed the instructions that came with the seeds, and excitedly watched the propagators every day for months, and made logs of the seeds' progress in a database. 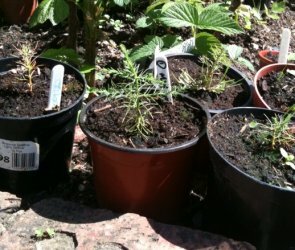 I have sown three species of the Redwoods, Sequoia sempervirens, Metasequoia glyptostroboides, Sequoiadendron giganteum, about 15 seeds each. 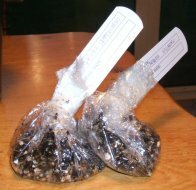 I pre-chilled the seeds as per the instruction and sowed them in a mixture of 1 part sharp sand, 1 part peat, and 1 part of ericaceous compost. 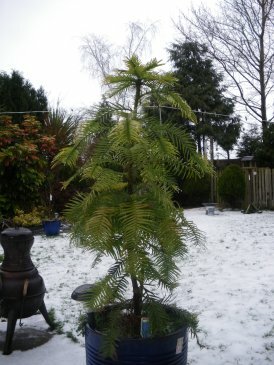 I pre-chilled the Dawn for 4 weeks, the Wellingtonia for 12 weeks and did not pre-chill the Coastal redwood. I sowed the seed in different times of the year – more to do with when I acquired the seeds, than when their ideal sowing time was. I sowed all the seeds in an unheated propagator in my greenhouse. 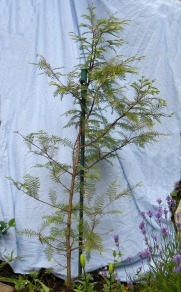 To my joy, in spring a few months later, I got 4 seedlings from the Dawn Redwood and 5 Seedlings from the Giant Redwood. Unfortunately I did not get any seedling from the Coastal Redwood. I have tried two batches of Coastal Redwoods and still have not had any luck. 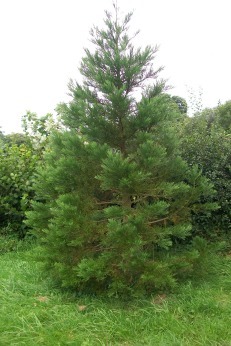 Sadly I lost one of Wellingtonia to mildew at about 1 year old. The others survived and have grown well since. In the second spring I grew three of them in the ground in an ericaceous soil mix along and I grew one in a 5 litre pot. All have done well, and are currently between 45-60 cm tall. The Dawn Redwoods – don't grow quite as rapidly – but they have done just as well. I grew them outdoors with 3 of them in 3 litre pots and one in a 5 inch Bonsai pot. All have done well and all now are around 25-35 cm tall. They have now shed their leaves in readiness for the winter. I see, what I believe to be healthy buds on the trunk, not all the trees have developed radial branches as yet. Hopefully next year they will be more Branching. Thank you for your story with Redwoods, Mark. Your trees are looking healthy and good luck with your Bonsai Guide on Redwoods. Based on your own experiences it should be a big help for those who wish to attempt this themselves. Please do send your updates in the future. 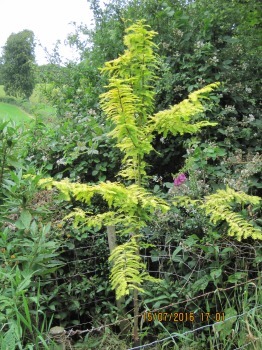 Liz sent a photograph of the Dawn Redwood growing in our garden in Pontefract, West Yorkshire. It was grown from seed by my father many years ago. Unfortunately it has lost most of its needles but it will give you an idea of what it is like. Thank you Liz, your tree is doing well. It must be nice having a tree that your father grew from a seed. Another photograph in its Spring / Summer foliage would be good if you are able to take one next year. Emil - November 2007 Emil from Sweden first wrote at the beginning of the month and then sent an update after a couple of weeks. I'm growing a Giant Redwood. As of today I placed it into the shade, since it didn't seem to grow at all anymore under the lamp. I had 3 seedlings but 2 died. I would very much like some advice. Since I now have only 1 seedling left and I wanna make sure I don't kill it... It takes so long to grow a new one (I've planted a seed just in case though. Thank you Emil, your seedling looks in good health, but this is the crucial stage of development when they can fall foul to their biggest enemy, over-watering. I have lost many seeds to this before I realised that I musn't make the compost soggy, and I try and water from the base (using a plastic saucer under the pot). The best place for them in terms of light is in a window or greenhouse, but shaded from direct sunlight in the Summer. Keep persevering as you will eventually be rewarded with a stunning tree. I can see more needles growing in the middle of it (at least 4, more soon hopefully). Thanks for the tips I'll try not to give it too much water (I already water from the base), and keep it out of direct sunlight. As I said before I planted a few more seeds and at least 2 of them are digging into the the dirt and growing quite fast at the moment. Once the seed fall off I will take them out of my mini greenhouse and place them with the other one. Here are my GIANT Redwoods! The big one is about a metre tall in its pot and doing well - the trunk is about 10 cm across and looks really chunky for its size. It grew a foot last year with some feeding. I bought it as a seedling from the Eden Project in 2001 so it's smaller than it would be in the wild - the photo shows the original package for it. It wouldn't fit back in there, that's for sure! There is some odd browning of the foliage on the new growth, any idea what that might be? The three babies are only a centimetre tall but spiky looking. They have been left outside and haven't grown since about last September. I'm hoping they'll come on in the Spring with some feeding. As for the other 77 seeds - nothing yet but I'm hoping that Spring will bring some news. 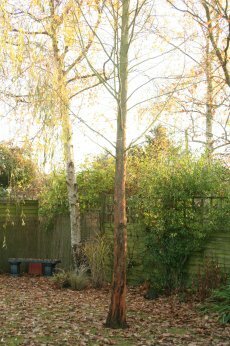 Thank you Richard, your large tree looks to be a fine specimen and growing well and good luck with your new seeds. Regarding the browning and curling of the foliage, where it occurs along the side of a stem rather than the whole stem, I have found this to be caused by a tiny bright green caterpillar/larvae. Try and inspect your tree regularly and squish them, sometimes they hide in a fluffy cocoon formed after gathering two small braches together, clever but annoying! They are about 1mm across and up to 5mm long and so far this appears to be the only insect that does damage to my trees. It can be very annoying if one of them decides to attach itself to the top growing tip because, if I have not found it in time, it will force the tree to have to start a replacement leader. Giant Redwood "I have a small giant redwood in my garden in Cheshire. It is about three feet tall, about four years old and growing very fast." 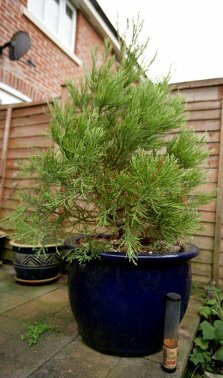 Shane also has a coast redwood of the type "ADPRESSA, it only grows to about six feet so it's ideal for growing in pots. It is very dark green and the new shoots are very light green." Thank you Shane and good luck with your young trees. I am not sure how long before the tree is bursting through your fence though! "This is my redwood. It has grown a lot since the last picture. Good news though, it is being moved to a better place, to my friend's father-in-laws house, a big hall with lots of land." 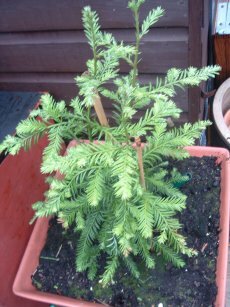 I am pleased you have found somewhere with lots of land to plant your redwood, I do hope it survives the transfer, it has grown well in two years. Shane also has a Wollemi Pine. 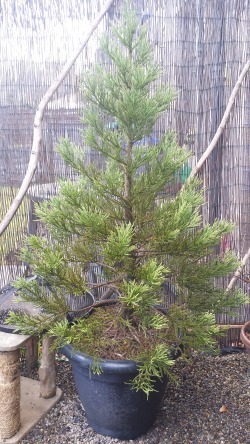 "I wanted to share a picture of a Wollemi Pine with you and the other tree enthusiasts in the hope that more people will buy it and in doing so help to save this critically endangered tree. There are only 100 mature specimens left in the world. As a tree lover I've done my bit in saving this fantastic fossil. It has a coating of a white wax on the buds to protect it from the cold temperature. They are called polar caps and they think this may have been a survival strategy that has helped it survive many ice ages. It is a truly remarkable tree and I think it deserves a second chance." "This is the pictures of my redwood's new home Hankelow Hall, a mile from the village of Audlem. I would like to thank Kirk and Bev Shenton for the new home. It's in a fantastic place right next to the hall which is being rebuilt. 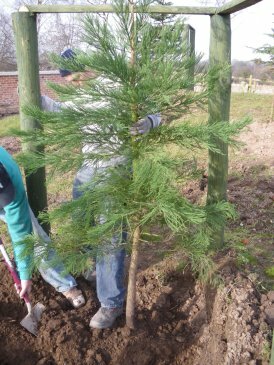 Kirk also has a fantastic tree collection with many new trees being planted cedars, oak and spruce. 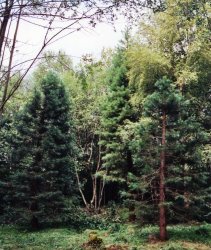 Kirk also has two small coast redwoods which are too small but when they are big enough they will also be planted out in front of the hall. 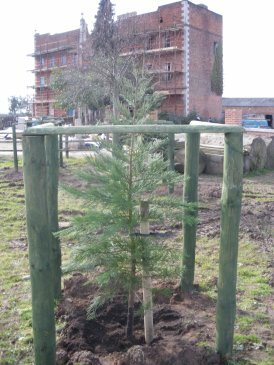 A big thanks to James Shenton and Tony for planting the redwood." I'm sure your tree will thrive in its new home and it certainly looks like it will be a lovely setting when the building work is finished. Giant Redwood February 2008 The large Giant Sequoia at Ashford Lodge was the reason for calling on Simon back in 2008. Then we discovered he also had a young sapling he had bought in a pot to someday plant in the grounds. In March 2015 he wrote with good news about his young sapling. 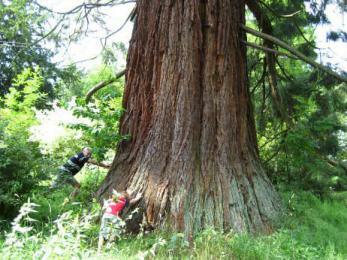 In 2008 you came round to measure our redwoods – a giant and a baby in a pot. Since then the baby has been planted and has grown rapidly, now measuring 15ft I expect. I am very pleased that your baby has grown so well! I know how rewarding it is seeing a sapling growing from what was once a tiny seedling in a pot. 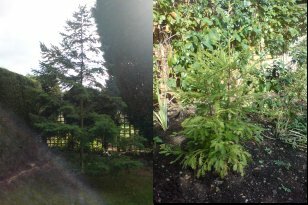 I have started my own collection of Sequoia and now have an example of all three in the garden, none are particularly large yet - the sempervirens only being planted a couple of weeks ago (is it one of yours?). They can be seen on our NGS yellow book open days (look for Barnfield in Essex). 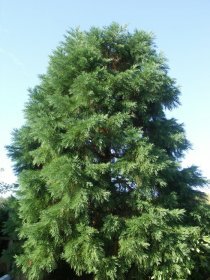 The wellingtonia came from Horseshoe Nursery at Bicknacre, as did the one I planted in the garden in Maldon (25 North Street, CM9 5HH, best viewed from Victoria Road) a few years previously. When I bought the Maldon tree there were two to choose from in containers, and I am sure that the one I have here is the second one from all those years before because it was so pot bound. It has been quite slow growing compared to the Maldon tree, and has a much tighter habit but it is starting to grow quickly now. 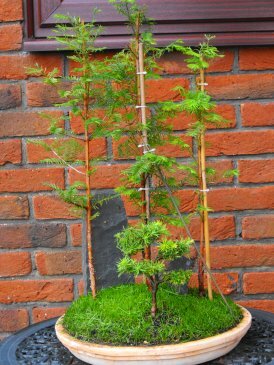 Thank you Paul, a lovely trio of Redwoods and the sempervirens is indeed one of mine! It looks as though you have done a great job with the planting of it. 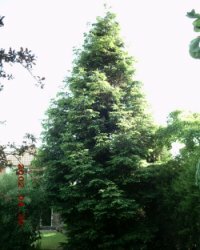 I have also planted one of my Coast Redwood trees in Colchester Castle Park, I did this back in November 2005 with one of the Park Rangers and it is really roaring away. It now makes the support stake look like a matchstick! 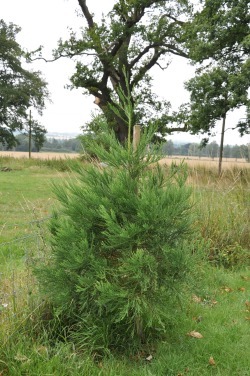 I also admire your Sequoiadendron giganteum - it looks like a fine specimen. 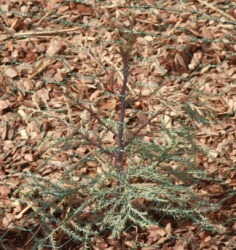 The Dawn Redwood looks healthy in its early Spring foliage. I hope to pay a visit sometime in the future. 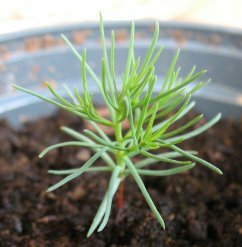 Which kind of Redwood Tree have I germinated? The seed packet said Giant Redwood and Coastal Redwood seed mixture. Can you tell me which one I have please? 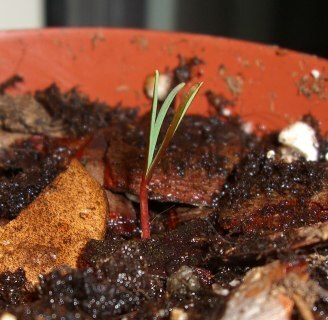 Congratulations Jed on successfully germinating a Redwood! 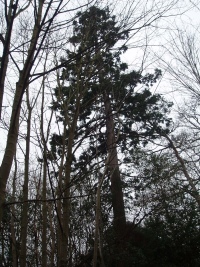 I believe it is a Giant Redwood or Wellingtonia. 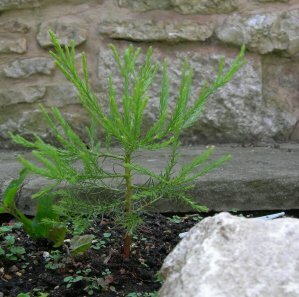 (The Latin name is Sequoiadendron giganteum). Perhaps you would like to let me know how your seedling progresses. My name is Thomas, I'm French and I'm a redwood lover too. I regulary check your website to learn more about redwoods growing in Europe. And all I can say is that you're doing a great job. 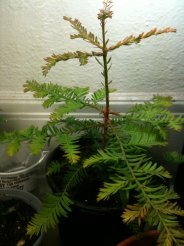 I've made an album to show the growth of all my redwoods. You have a very impressive collection of Redwoods Thomas, (and a very impressive command of the English language too! ), thank you for permisson to use some of your excellent photographs. Good luck with all your Redwood growing. George - May 2008 George has had some success growing Redwoods from a seed kit and from gathered seeds. I received the kit this morning, its amazing, I will be sorting it out when I get home (from school), thanks. I'll keep you informed. End of May 2008 Yesterday I saw a green shoot. its about 5 mm, but when it's stood up in a straight line it should be about 1 cm. It's amazing. July 2008 I've been having success with my redwoods, I have had one giant survive this far from the kit I got from you. I have also got a good one growing (about 5-6cm) that I sowed in the UK about 1 week after getting the kit from you. I have a few others growing but those are the largest two. I have so far successfully germinated about 5 seeds from the uk and I'm currently working on about 20 more (So that's about 500 seeds I'm using). I am so pleased to hear that you have a redwood growing, and so incredibly quickly. You should certainly have quite a few successes with the amount you have sown! I hope they continue to thrive. My redwood kit: 3 giant germinations, no dawn, no coastal. Strange that one of the hardest to germinate is what I have more of :). I could have been creating (without meaning to) the perfect conditions of giant redwood germination, but not ideal for the other two maybe. I'm interested in coastal because of their faster growth, it's something that I can check up on every day and maybe see a slight change. I've included 3 giant redwood pictures, you can see that one of them is wilting and has lost some of its colour. I fear it may die, I've supported it for now with two cocktail sticks, I suppose I'll just have to wait and see if it pulls through. Do you have any tips on saving it? 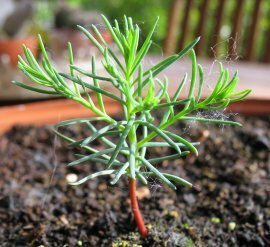 You are right, it is strange that you have grown the most difficult to germinate (Giant Redwood - Sequoiadendron giganteum). As for the condition of your seedlings, I am afraid the cocktail stick one is probably beyond help. (Although if you allow it to dry a little you might be lucky). My advice is to not to water the Giant Redwood seedlings quite as much as you are doing. Looking at the photographs, it appears as thought the compost is quite soggy at the top. I have found through my own experience that this is the surest way to lose them as seedlings as they prefer a much drier compost. One trick is to pick up the pot and if it feels feather light, then water, otherwise - don't! Also, I have been using a small tray and water from the base. This keeps moisture in the compost but allows the top to be nice and light and airy. Tam - August 2008 Tam (our top Scottish Redwood spotter) has also grown some Redwoods of his own. I also had some cuttings from a few branches of a Coast and I potted them all over the garden in hanging baskets and pots and in the ground. A good number of them lasted over the winter with new growth appearing this past spring. I lifted them all carefully and potted them in little pots and the were all doing fine until we had a really warm day last month and they all burnt out in the green house aaarrrgggh. I have since managed to get myself some more cuttings and am embarking on the journey once more. Glad you have enjoyed reading the Tall Tales. I have myself experienced all of the trials and traumas that you have gone through, so I very much sympathise with your plight. All I can say is persevere, it's just like learning to ride a bike, you get there in the end and wonder what all the fuss was about! Although now and then I still manage to mess one up. 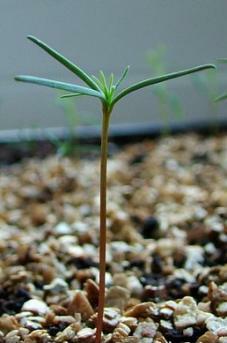 Here is a photo of my Sequoia seedlings from last year. I can hardly believe they lived through that winter, I left them outside under the shelter of a plastic garden chair. I am now cautiously optimistic that they will make it to proper little trees!! 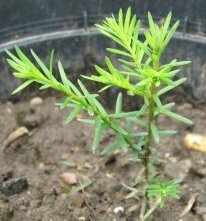 I also have grown some Coast seedlings and have found them to be very tolerant of disturbance compared to Giants, I had one out by the root the other day and managed to pot it up and it seems fine. 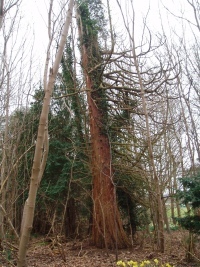 This Giant was planted in private woodlands in Stratford St. Mary on 21st September 2008. At time of planting it measured 104cm and was about 5 years old, having been sown in June 2003. Adrian says Even at just over 1 metre the Giant is a striking feature amongst the other trees. Congratulations on making the best sapling fence I have ever seen! 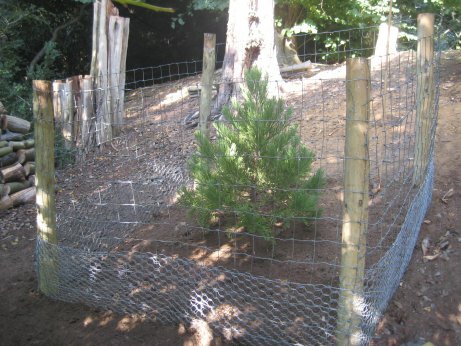 Plenty of space for the tree to grow, small pitch at the lower foot or so to stop rodents, and broader pitch above that to keep the larger animals at bay. Well done, it must have taken you some time to build. I hope the tree thrives in its new home. Now that I had planted my very own little giant redwood, the hunt for other larger examples had begun. I followed Ron's guide of local redwoods and found a spectacular, young example of one in Colchester's Upper Castle Park. I couldn't believe how soft the bark was - it reminded me very much of the texture of the outside of a coconut. When I met up with my wife a short time later I remarked about this find and the texture and colour of the giant. She then replied 'we've got one just like that!' Bearing in mind I had been longing for one of these ever since I was a child (and having just collected my very own one from Ron the previous week) I was somewhat surprised to say the least! My wife, who grew up in the property where we now live, went on to explain that this tree was located about 300 yards from our house in another one of the woods. It transpires that my wife, her brother and her sister spent many hours playing in that wood as children and they loved this tree because of how soft the trunk was. Guess what happened next? - I was off at high speed to that wood with camera in hand. And there, to my delight, was our very own pretty well grown giant (approximately 100ft). Those 'discovery moments' - Superb!!! Superb indeed, thank you, what a marvellous tale! My prize giant (that I made that fantastic enclosure for a couple of years ago) looks exceedingly worse for wear. This is causing me much angst! I have watered it at a reasonable rate over this time, but since about January it started to go brown and is now fully so from head to foot. The needles are all very brittle and there is no sign of new growth. The needles are all very brittle and there is no sign of new growth. One of the other two giants is also going the same way. I am hoping this is a temporary issue, perhaps caused by the late frosts that may have caught the trees whilst producing new growth, and that both will recover during the next growing season. My two Dawns are doing superbly, as are my three Coasties and my remaining Giant, so not all bad news. I am very proud of all these (particularly the Dawn by the pond) - and my youngest daughter, now 11, seems to have got the redwood bug too. Only yesterday she again took the opportunity to touch the top of all three Coasties and remarked that one day should would tell her children that she had touched the top of the tallest trees in the world (well maybe they will be the actual tallest in another 1000 years or so). 1. Rodent or small animal nibbling the bark. 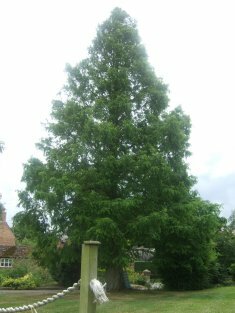 I have had a Dawn redwood that I planted in Maldon cemetery fall foul of a small creature nibbling away the bark all the way around a few inches from base of the stem. I wonder whether something has managed to get under or over your Colditz-style fencing! It's worth taking a close look near the base to at least eliminate this possibility. 2. Under-watering. This seems unlikely as you say you have watered it regularly. I tend to water my plantings in mid-Summer heat during their first year (or two) to save them from drying out, but I did lose one a year ago that I planted out in a place I couldn't get to in order to water it regularly during the first Summer. 3. Over-watering. I know this sounds odd given that the tree is in the ground but if the soil is clay-based and the root ball is sitting in a pool of soggy soil this could cause the tree to go brown and die. 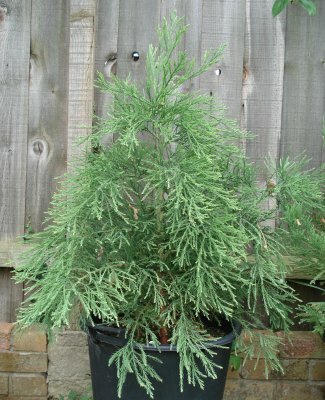 I've not had this happen with Redwood trees I have planted out but I have had it with one or two in pots. Many years ago I did have this happen to a fruit tree I planted in my garden. Someone told me they need lots of water after planting and in my inexperience I over-did it somewhat! Again, you sound too experienced for it to be the case with your one but it might be worth thinking about if you had been watering it outside of mid-Summer as it is easy for unused water to accumulate. 4. Frost. There is an outside possibility that the hard frost we had this year is to blame, although I myself have not lost any trees of that size to frost, I have had a couple of 6"-ish high potted ones succumb to the cold icy wind and frost. Your one was doing so well prior to this winter so it is possible yours just happened to be susceptible although it seems unlikely to have two such examples. 5. Nature. Perhaps sometimes plants just go wrong, as with animals and people. 6. Insect attack underground. Although Redwood trees don't have a great deal of critters that munch on them when they are more mature, I have noticed that young fresh growth on juvenile saplings/seedlings can get nibbled by insects (and animals). I wonder therefore whether you have had something eating at the roots. It's unlikely but not impossible, so once you have finally given up on the tree and dig it out it would be worth having a close look at the soil and the roots to see whether there is any sign of this (although the insects themselves may have moved on). I often wonder about crane fly larvae and whether they might cause damage. Although I rarely use insecticides, I have taken to giving my potted saplings a mild spraying a couple of times a year to hold back greenfly and tiny caterpillars that seem to go for the young fresh growth. Let's hope the replacement Giants that you plant this Autumn will do much better than their predecessors. This was rather a long-winded reply and apologies if I seem to have concentrated on the bad part of your update, but things go wrong in spite of our best efforts. I hope my suggestions may help others with such problems. I am very pleased to hear (and see) that your other trees are doing well, and it was such a terrific anecdote about your daughter's budding interest in Redwood trees. I am very impressed that she is already thinking of the future generations that may one day be standing under the shade of some very tall trees in your neck of the woods! Giant Redwood (under a trunk) Very Definitely R.I.P. "Lucky one of those two giants was indeed dead as at 0710hrs this morning I heard a massive crash and rumble and..... well you can see for yourself!" Unbelievable! I finally stopped laughing and realised what a shame about your fantastic Colditz-style fence. Yes, it was indeed lucky that the Redwood was dead, you couldn't make this stuff up, no one would believe you! I will admit though, when I first read your email I thought "oh no! 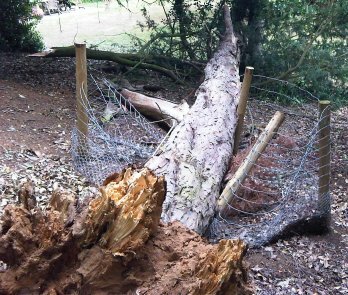 ", it looked as if your large Giant Redwood had fallen over - and me having told people for the last umpteen years that they very, very rarely topple. It was a relief to see it was a non-redwood tree after all (still a loss to yourself I'm sure). "Fortunately I had not broken into Colditz and investigated the root system of the giant - could have seen a new high jump record if I had been inside and the other tree had began to topple." 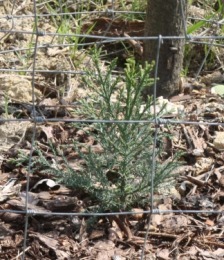 As can be seen from the photographs in 2012 Adrian's young Redwoods are all doing well thanks to his care and attention. We were very lucky with the weather on a sunny morning in July 2014, when Adrian and Sally kindly allowed us to visit and measure their Redwood trees. The young saplings that are under cover of the taller trees are all looking very healthy but are growing a quite slowly, as is to be expected given the shaded conditions. Those that are out in the open however are really starting to romp away and are putting on lots of fresh new growth. One of the features of their garden is the enormous Swamp Cypress. This is a huge and handsome specimen, probably ranking among the tallest in the U.K. Dawn Redwood - November 2008 Clive wrote asking about the loss of bark on his Dawn Redwood tree. Clive says We have a meta sequoia in our garden. We bought it a number of years ago partly because we liked the look of it and the label said it grew to 15 feet max. Then we saw the specimen in the Botanic Gardens here in Cambridge! Still, we can say to visitors just go towards the big tree. I noticed today that the tree has lost substantial area of its bark, say up to 8 feet from the ground. I can't see the bark on the ground. I don't recall this happening in previous years. My question: is this normal, a disease or maybe animal damage? We do have muntjack deers here. Either way do we need to protect the tree in anyway from winter damage? It is difficult to say for sure but I would say it is likely to be damage done by the deer. Perhaps a small fence around the trunk (not too close) is the solution, at least while the tree is relatively young. I often see fences around Giant Redwood trees when they are situated in fields where animals are grazed or have access. 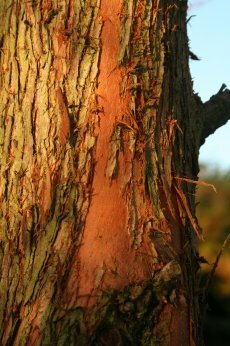 Your Dawn looks in good health apart from the bark damage, and yes, the place where you bought your tree might like to think about re-labelling! Aleksander Perelygin - February 2009 Aleksander from Russia is doing extremely well with his redwood germination, as can be seen from the photographs. Sequoiadendron giganteum - February 2009 Hello! I have plans to acclimatise Sequoiadendrons in Russia, at latitude 53°N. I began the process of acclimatisation of the seeds (some of them will be stratified in a damp substrate with a temperature around 2 to 4°C, with the subsequent sowing in the spring in open ground). Several seeds have already been sown in pots, I am watching as they germinate. 20% germinated, half of those have died, leaving the strongest. But new seedlings still continue to sprout. I use a universal compost/soil for plants, with neutral acidity. What are the lowest temperatures you experience in England? I am impressed with your work so far. The only drawback when lots germinate so close together in one pot is that seperating them without killing them can prove tricky. I usually keep the strongest looking and sacrifice the others by cutting them away with scissors. The normal winter temperature in my part of England (South East) is usually a little below zero centigrade, the average being around 5 degrees centigrade. Although we are on the same latitude as you, we are protected by the warm ocean currents which raises the temperature. 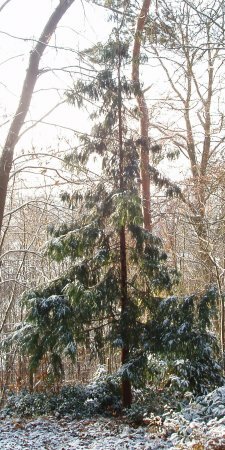 The Sequoiadendrons are used to the cold of Winter in the West, but they usually have the protection of a layer of snow to protect them from cold dry wind and the severest frost. Usually our Sequoiadendrons survive the Winter with a dark blueish or brownish colour, but they soon become green again as the weather warms. Good luck with your experiments and I hope your seedlings cope with your weather. March 2009 I left one strongest seedling, this giant is ok. I am attaching a photo to this email, in which there is one of those seedlings of the previous photos. The thing what makes me worry is that its young needles are flaccid (drooping), maybe because it doesn’t have enough of light? Or anything else? It is too early to assume that it is dying or in trouble, and the most important thing is it looks nice and green. I would avoid leaving it in direct sunlight if it is in a greenhouse or indoors, and if it did have a plastic cover while germinating this should be removed to allow good air circulation. Other than this, the only other thing you should do is take care not to over-water. I keep mentioning the over-watering because it seems to be the most common problem people have (including myself). People assume that the compost needs to be kept quite soggy, as one would with most flowering plants but in reality it needs to be realtively dry with modest watering from the base. 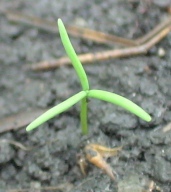 June 2009 One Metasequoia with three cotyledons!!! According to the BBC's weather data, London and Seattle have almost the same average temperature profile. Also, although apparently it rains sixty percent of the time, the amount of rain that most of Britain receives is around 750mm. Is this representative of the weather in the south of England? If so, can you hazard a guess as to why a low lying island with fungustastic temperatures from ~March until October does not appear to have near the problems that a middle altitude brick of clay does? I don't know whether you are familiar with the soil in these parts, and if not, let me assure you, it is simply squishy brick. I don't know, something about how the southeast is supposed to be forest and not pasture. Epsom Salts are my favorite tool. Cheap and efficient, it combines two things your garden needs: magnesium and sulfates. Redwoods of all kinds are greedy for the Mg, and the sulfates repel fungus. Plus, the pH is 6.0. The cinnamon is excellent at repelling fungus as well, especially the more common dampening off species. It is a great preventative, and even works at times to get rid of an infestation. *A good growing medium is coconut coir and sand, about 3:1 mixture. In case you aren't familiar with coconut coir, it is a waste product of the coconut industry which has the ability to hold a bunch of water and air. It is often used for hydroponics, but I just jam a bunch of the fibres into a humidome and water periodically. As for nutrients, there is a little bit of potassium and phosphorous, but that is it. I have grown ~50 metasequoias, 30 sempervirens, and 15 giganteum. I have lost zero percent of the metasequoias and sempervirens to fungus, and only one giganteum. Now, fungus gnats are my biggest problem. Since the grubs can't eat fungus, they sometimes try to eat my roots. Not only does the sugar attract the flies, but the yellow hue does as well. This will not end the problem, but it may prevent it, and it can regulate a bad infestation. Also, there is a pair of Dawn Redwoods on campus that I got seeds from this fall. After filtering out the floaters, I got about 30 percent germination. I believe metasequoias like hot, humid summers. I have some in the greenhouse right now that are 4 months old and almost a foot high, grown indoors. I know that the ones around here that I see enjoy our lousy weather, could this be a factor in quick maturity? I don't think that it rains here sixty percent of the time, I don't know the average figure but if I had to guess I would say between five and twenty percent of the time. In fact I have even had to water some of my pots during 2008 winter, although this is not the norm. Sometimes though it just seems like it rains 100% of the time in England! The soil in my area is clay, I don't think this is the best soil for Giant Sequoia but there are quite a few here that thrive. As for your Dawn Redwoods' rapid growth, yes I have found they rocket ahead of the Giant Sequoia. As long as they have warmth, light and plenty of moisture they seem to do extreemly well. For my compost I generally use a bag bought from the local garden centre. Pretty average stuff, I have tried more expensive brand name composts and got the same or poorer results. For germination I would not use compost from my garden because I understand there is an advantage in using a sterile medium for the seeds. Keith wrote, As a former teacher of Botany I was gratified to see letters written to you by young people. I live in Mount Vernon, Washington State, USA which is about half way between Seattle and the Canadian border. Our climate here is similar to that of southern England. The westernmost of my beautiful trees taken in early spring. In the far left is a volunteer Western Hemlock (Tsuga heterophylla). On the right is a rather unstable old Western Red Cedar (Thuja plicata). On the very far right is another of my Redwoods. In the foreground are several Vine Maples (Acer circinatum), a locally native small tree. Near the base of the redwood is Pseudoacorus, which we call "Ditch Iris." Were it not for the trees there would be a view of the San Juan Islands. I planted my 6 Sequoia gigantea trees in 1988. They were, at the time, about 50 cm in height and in 1 gallon cans. The first thing I did was put about 4 inches of chopped up Douglas Fir bark as a mulch to keep the poor soil moist. For the first 5 years I fertilized heavily with "tree stakes" which are sold here to fertilize trees. They were driven in at the drip line. They grew very quickly and it was only necessary to irrigate with sprinklers a few times during our dry summer. As of 2008 no irrigation is necessary. 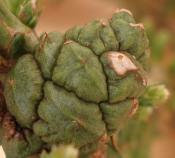 In a mere 21 years the trees are now about 50 to 75 feet tall and of reproductive age, producing both male and female cones quite high up. The trees dominate this part of my neighborhood. Fortunately several of us neighbors verbally agreed to not put in any fences, so our little area is much like a nature preserve with abundant wildlife (deer, rabbits, squirrels, coyotes and once even a bear). My tallest Redwood taken after a rather heavy snow storm. The branches in the far left of the picture are Korean Dogwood (Cornus kousa). Thanks for your Tale, yes it is heartening to have young people becoming interested in the trees around them, especially when they are redwoods. Your little communal nature reserve sounds idyllic. Most gardens of the average home in the British Isles are too small to plant such a collection of large trees, but every now and again a cluster of Giant Sequoia can be discovered in public parks and open spaces. Not a coyote or bear will be seen though! Mark Jones - March 2009 Mark proves that Redwoods can be kept in pots for many years! Giant Redwood I have a great potted Wellingtonia (must be getting on for 10 or 11 years old now) which I keep in the garden. It is sort of a shame to keep it in a pot (like keeping a bird in a cage!) but if I did plant it in the ground now it wouldn't take long before it looked leggy and out of proportion. Not a day goes by that I don't stop and stare at it when looking out of the kitchen window - much to the amusement of my wife! I have just received my job lot of Dawn Redwood (which I was just reading on Wikipedia is classed as critically endangered), Wellingtonia and Coast Redwood seeds from Chiltern, so will be getting those into the propagator tomorrow, and then out into pots (or straight into the ground at the allotment in the coming months). I will keep you posted on progress. Eventually, I'd like to buy a small area of land in the countryside and plant a grove of these fantastic "home made" trees which could be enjoyed by future generations. Obviously this is a long term project and would love to get your comments or advice and hopefully over the next few years I can make some pretty impressive progress. Thank you for sending your photographs, your Wellingtonia looks quite at home in its pot, and I can sympathise with the staring from a window - they are just such great trees to look at. I too would love to be able to buy a small patch of land and plant a grove. Perhaps one day! The only advice I can give at this stage is to sow as many of each type as you can manage. They take a while to get going from seedling stage, particularly the Giant Redwood, so the best thing to do at this stage is to leave the planning of the final planting arrangements until much later and concentrate on getting ahead with the early growing years in their pots. The other thing is, once you have seedlings of a few inches in height, don't be tempted to keep them indoors in the warm central heated areas of your house or they may die from among other things, fungal attack. Much better to keep them in a cool greenhouse or a sheltered spot in the garden, or an unheated conservatory or lean-to. People often forget that like most temperate climate trees they need a cold dormant period through winter. Good luck with all your growing efforts. Kuba Biel - April 2009 Kuba is from Poland and his sowing of Giant Redwood has yielded a good germination rate. Giant Redwood seedlings 2009 I bought some (20) seeds few months ago and sowed them immediately. After few weeks only one germinated and it died few days later. So I bought another 20 seeds, put them into warm water (ca. 25 C ) for two days, and then I put them (mixed with damp sand) to the fridge for almost 3 months. At the begining of April I sowed them all in the one (unfortunately) quite big box. Through the next 3 weeks ten of them germinated – I believe it is quite a good result. I know (after reading Tall Tales) I will have a problem with replanting them, but I also noticed that three of them are a bit different than another. Most have a bit reddish trunk (if I may say so) whereas the three mentioned above are green "to the roots". The seeds I bought were meant to be giant redwood but now I am not sure whether all of them really were. I hope the picture helps a little. One more question: when is the best time to move seedlings to their own pots? Now? A week ago? 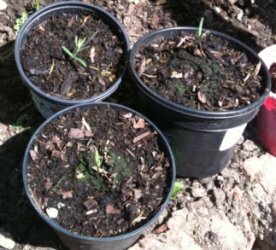 Thank you for the photograph of your young seedlings, they are definitely all Giant Redwood, I am not sure why some have red and some have green stems. When you transplant your seedlings don't forget to use a dessert spoon, to try and minimise the disturbance. Where there are a clump of them together (such as the four I see in your photograph), don't try to separate them, move them altogether in one scoop and put them into the pot as they are. Hopefully at least one will survive, and after a month or two you can snip off all but the strongest. I know this sounds a bit of a waste but if you try to separate the close ones you are more likely to kill them. I would leave transplanting for another few weeks or so, at least until you see a cluster of needles on each rather than just the initial prongs. Good luck with your seedlings and let us know how you get on. 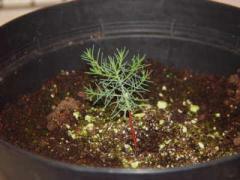 Kuba sent an update of his Giant Redwood seedlings. "As a year has passed I send some up to date photos of my redwoods. There are also this year seedlings – I plan to sow 20 seeds every year. Its good your site is still working – it's nice to read new Tall Tales from time to time." I am pleased to see that last year's seedlings have survived the transfer to individual pots and are doing well. You also have a fine clutch of newbies, it is heartening to hear from people who persevere with their attempts to grow Redwoods. Initial failed attempts can be quite disappointing, but it is always worth trying again as the results are very rewarding. 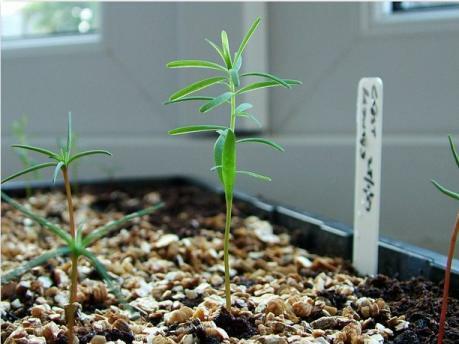 Kuba's 2014 update shows two of his Giant Redwood saplings are healthy and growing well, despite various setbacks. "1. The first picture is my first Redwood going into wild in the year 2011. 2. After 3 years, and one really severe winter, this year (2014) it has grown about 20inches. 3. From later sowing and 2 year later replanting to Grodnu is the third picture – different place, different soil, wind and temperature conditions also different. It lost its top in first few weeks after planting and one branch takes the leading (surprisingly for me the really bottom one). 4. Now it looks like this in picture four." Ryan Thompson - May 2009 Ryan lives in Virginia U.S.A. and is 16 years old. Ryan's greenhouse Ryan originally wrote to Redwood World in July 2008. He sent a photograph of his greenhouse that he built in 2 days and asked What can I feed my redwoods? My coast Redwoods are about 2 months old and about 4 inches tall. What plant food do I feed them that is available in the U.S.? Do you know? Am I supposed to feed them at this young age? What about the Dawn and Giant sequoia seedlings, do I feed them too? I was in the habit of feeding my young redwoods but over the last few years I have experienced a problem with the bending over at the top and I believe this may be due to over-feeding. I suspect the shoots were growing far too quickly and not developing enough fibrous strength in the new stem. Otherwise they seemed in excellent health, so I had been rather perplexed for the last few years. A collegue who had been looking after some for me did not have this problem but rarely, if ever, fed the trees. So although I am not 100% certain of the cause, my advice would be to hold back on the feed and watch your baby trees race away on their own. Since I have stopped frequent and over-enthusiastic feeding, I have noticed that the wilting problem has vanished. I would perhaps use a half-strength solution twice a year but only after the first year. You could try Phostrogen, or similar, or perhaps a mild solution of ericaceous feed. Sorry to be a bit vague but I am also still learning! 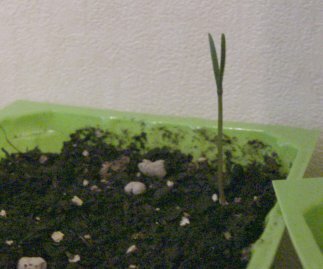 In August 2008 Ryan wrote, I have a young 2 month old Giant Sequoia seedling here in my house. It hasn't even begun to grow its branches yet. Is this a problem? Should they grow faster? I actually have 2 trees doing this. Can I make them grow any faster? What is the average seedling growth rate? Is mine growing fine (slow, fast)? Don't panic about the slow growth, they do seem to take ages to grow the first few inches. Just look after them, be careful not to over-water, and in six months or so you could be searching around for a larger pot to house it! In May 2009 Ryan sent photographs of his trees. 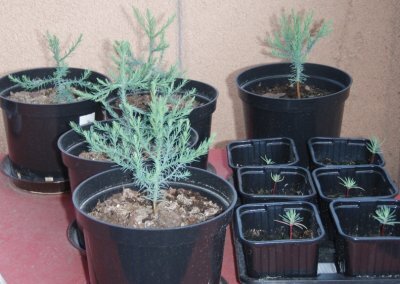 I have successfully grown several of each of the three species, as well as other species, of redwood trees. The Coast Redwood in one of my pictures is about 1 year and one month old. The Giant Sequoia is about 5 months old. 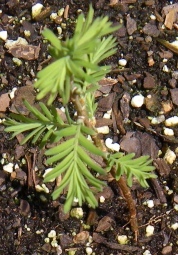 The Dawn Redwood is about a year and a month old as well. I have grown each tree shown in the pictures. 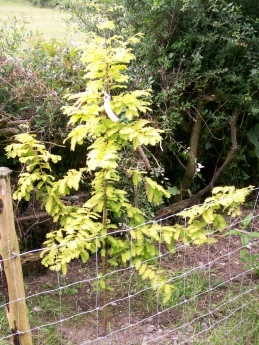 I also have included another Dawn Redwood that is around 2 or 3 years old. The 1 year old Dawn is the one that is just coming out of its dormancy. I was reading through the how to grow area of your site and I wanted to offer another suggestion. I always use a method that involves a wet paper towel. What I do is wet down a paper towel, coffee filter, etc. 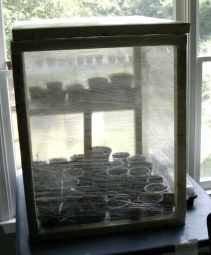 I then take the seeds and place them on the wet cloth and place that into a sealed container. What happens is as the seeds germinate, I take them out of the container and can plant them into thier own pots. I find this much easier and effective than planting all the seeds together. I highly recommend it. Happy Growing! After the obvious meticulous care, time and attention that Ryan spends on his trees, I was very pleased to hear that he has had much success with his Redwood sowings. They all look very healthy, well done Ryan! I hope your redwoods continue to thrive and in just a few more years some of them will, of course, be taller than you. Thank you for the growing hint, it sounds intriguing. I will try it sometime soon. Ryan wrote to say that his Giant Sequoia had "grown to almost a foot tall and is growing crazy. It filled up a large pot I had it in, so I planted it in the yard." 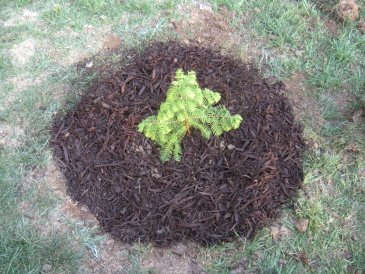 Ryan also sent a picture of his Dawn Redwood which "I planted in my yard. Both are incredible." Thank you for the pictures of your Giant Sequoia and Dawn Redwood. They are both looking good and it looks as though you have done a fine job of planting them out. Ryan sent photographs of his Redwoods and says that his Coast Redwood is now about 4 feet tall. 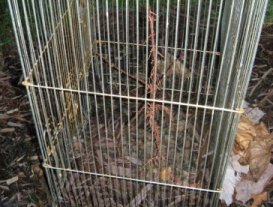 Unfortunately his Dawn redwood had been attacked, Ryan says "I put him in a cage so that he would stop being attacked and maybe recover. I'm thinking it is most likely deer that came to my yard and did it. The leader of the tree was completely chewed off. Think the is still hope for him?" Thank you for the update Ryan. Yes, as long as the stem was not damaged low down, your Dawn Redwood should simply grow a new leader. Jose Camargo - June 2009 Jose is growing Redwoods in Brazil. 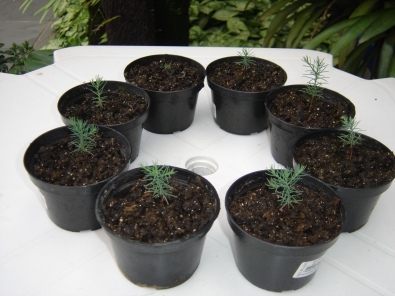 Coast Redwood seedlings I am trying to grow some redwoods but not in UK, in Brazil. I have 8 Coast and 8 Giant seedlings and until the end of 2009 I will get some Dawns, because I've just come from Boston and brought some seeds from there. I had lots of problems to start the first seedlings, because I made a mistake and seeded them during the Brazilian summer (32°+ for more than 4 months) but now they are growing very well. 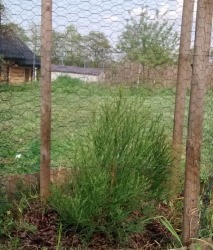 Thank you for the photographs of your young seedlings, it is great to see that they are doing well. It looks like the hot weather hasn't hampered your success. At the time of writing London is reaching temperatures of 32° but this is unusual and doesn't last for 4 months! Let us know how your Redwoods fare. 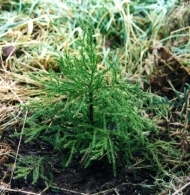 Coast Redwood sapling No. 1 I have become obsessed with growing trees. As a carpenter it is my way of trying to give something back. So 18 months ago I started trying to grow my own. I have some lodge pole pines growing, a few Chestnut trees, Oaks and some redwoods; Coastal and Dawn. The first Coastal (No. 1) that I attach for you is my first and doing really well (I think). At 18 months it is about 4'. The next picture is of a Coastal that does not appear to be doing well (No. 2). The top part of the trunk is dropped over heading into the ground. The needles on its upper branches are also drooping considerably and stuck together almost. I have also caught a Caterpillar trying to live on it. Is this usual? I would welcome you looking at this picture and letting me know if you think it looks normal or needs something? I have been trying to grow them in different rooms since winter is coming and I do not have a greenhouse for them to live. Unfortunately my home does not get that much light in. Thank you for the photographs of your young Coast Redwoods. No. 1 looks in great health. As for the other Coast (No. 2): You are the first person to write to me about finding the dreaded caterpillars - was it small and bright green? Ugh! I squish them as soon as I find them but that's usually not before they have gummed up some of the tender growing tips. I still have not found out what they are called and have not noticed them on any other plants in my garden. The caterpillars tend to pull and join (using threads) adjacent foliage and/or stems and wrap themselves inside. They then munch on the fresh foliage and stem. They seem to be more prevelant some years than others, you just need to be vigilant and investigate at the first sign of foliage being clumped together. I have noticed that occasionally my Redwoods have a tendency to have sudden growth spurts and then fall over top-heavy with a bunch of fresh buds at the top. Sometimes they right themselves but other times I have had to put a stick in to steady them for a while in case of permanent bends in the trunk. I remove this as soon as they seem strong enough to hold themselves though because I think the swaying of the wind helps to strengthen them (just a guess). I'm not sure what causes this wilting of the stem, the plants otherwise seem in superb health. I did wonder for a while if it may be over-feeding causing them to bolt, producing lush but weak growth and resulting in a dropping leader shoot. It's a subject I am still pondering! I hope by now your Coast (No. 2) has perked up a little but if not do not give up on it yet. I have found that, of all the Redwoods, the Coast seems to be the hardiest. If it gets cut back or the tip dies, it will send out more shoots and create a new leader. At 4 feet high I would suggest that, if you find a sheltered spot, you can over-winter your trees outside. Some of mine stay out when they are much smaller. Do not worry if your trees turn a bronzed or purple colour over winter, (I believe it is the harsh cold winds that do this). Mine do this every year and are fresh and green again in the Spring. Hope this helps a little, let me know how you get on. Giant Redwood seedlings I thought I'd better ask your advice for my Giant Redwood seedling's first winter. I planted the seeds in late June, and 5 out of the 12 survived. Now they're about 2 inches tall with about 10-14 green spines on each one. They don't look like your picture of a redwood after a few weeks though and I'm worried that the slow growth has something to do with the temperature. I'm growing them in England you see. Got any advice for keeping them warm over the winter? Thank you for the photographs. I am pleased to hear you have had a high rate of success with your seedlings. Over the winter I would keep your young seedlings indoors or in a greenhouse. At this stage they can very easily become water-logged and I have lost many a batch of seedlings by falling into the trap of over-watering. I am also in England and I keep my very young seedlings in a greenhouse over their first winter. The rate of growth you've experienced is probably about right (for Giant Redwood). They will pick up speed a little as they grow, but they do not grow as fast as you might have expected! Sophie replied, Over the winter the seedlings will be with me at university! I hope a warm windowsill will be alright for them, and thank you for your advice. You're welcome Sophie, a warm windowsill sounds ideal, provided they are out of direct sunlight in early Autumn or late Spring, when the sun is too fierce for seedlings under glass. Good luck, it would be nice to hear how your seedlings fare. 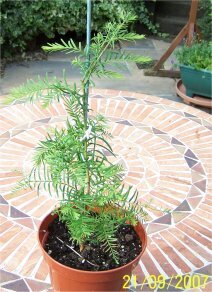 Giant Redwood Back in 1994 whilst in the US, I purchased a 6" Sequoiadendron giganteum seedling, since planted in the garden. It has grown well, albeit that the tip was twice damaged by birds. Now about 25' tall, girth 4' (at the 1.5m level). I took cuttings of the dendrons, one of which I gave to a local private parkland. I'll try to follow up on that. Currently I have more cuttings, though don't yet know if they have taken, as the green remains for a long time even if it has not rooted. Thank you for your tale Raymond. 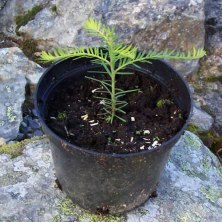 It is interesting that you mention growing them from cuttings, as I have recently discussed this with a Park Ranger from Sequoia National Park in America. 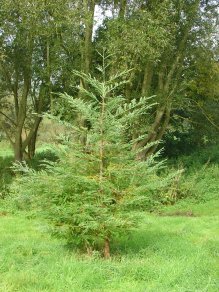 He was quite adamant that Sequoiadendron giganteum will only grow from seeds and never from cuttings or out of root base. While I would agree that it is very rare for them to grow from cuttings, we have also actually grown one that seems very healthy and is now 12" high! It would be interesting to hear how your latest cuttings fare. Giant Redwood I was born and raised in Portland Oregon, saw the California redwoods repeatedly from early childhood, and only moved to Russia "recently", in July 1991, when it was still in the USSR. 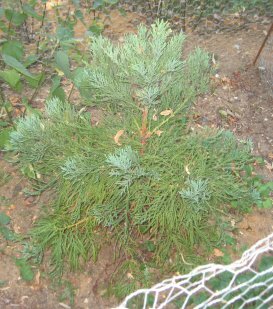 When I brought my Sequoiadendron sapling from California with the information that it would grow "2-3 feet per year", I was hoping to get permission to plant it in a local park when it outgrew my apartment. The minimum temperature I've experienced here is -25C, pushing the limit a bit perhaps, but with global warming it might be worth a try. Since I have a big apartment, I think I'll move my tree to a bigger pot and encourage it to grow, and eventually try to donate it to the park which is only a few steps from my front door. I suppose it would be more tolerant to cold when planted in the ground rather than a pot? 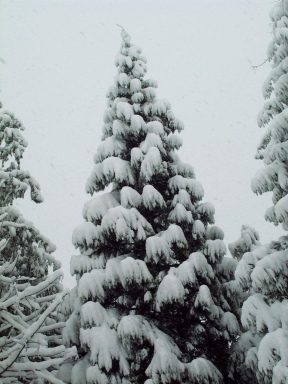 The cold may be a problem because although in their last native habitat the Sequoiadendron giganteum experiences cold winters, the young trees will be covered with a blanket of snow. This acts as a protective layer to shield them from the cold dry wind which does the most harm. It also helps keep the soil temperature a little higher than it would otherwise be. Keeping a temperate climate tree indoors during the winter is usually considered to be a bad thing because it deprives them of their cold dormant period, however in this case, while the tree is small, it may be the lesser of two evils! I suspect you are right to keep it indoors through winter, and put it outside in early spring so that it may have a month or so of temperatures close to its normal winter range. When you plant it in the ground, for the first few years at least, you might maximise the chance of surviving the cold Russian winter by spreading a good layer of bark chips or something similar, around the base of the tree. I suspect you are right to assume that the cold would affect it more in a pot than in the ground. Your tree looks pretty healthy, so whatever you are doing so far can't be bad. Giant Redwood I have been to the giant forest a couple times, to mountain home grove and mariposa grove. I have also been to vancouver island, jed smith redwoods, prairie creek, montgomery woods and humboldt. I have planned another trip to the coast redwoods in October. I want to take a closer look at some redwoods with more complex crowns (from the ground with binoculars). I just got back from England where I met an old friend and we went to Kew Gardens. On the way back we saw the Dawn Redwoods next to the road in Shoebury - Bournes Green Chase. My friend and his family live in Thorpe Bay, maybe half a mile away. We stopped and checked the trees. Back in Germany I found your wonderful website. 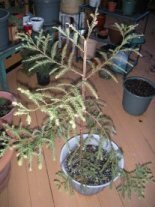 I also grow giant redwoods from seeds (bought and collected) and I have one that sprouted from a cut twig. 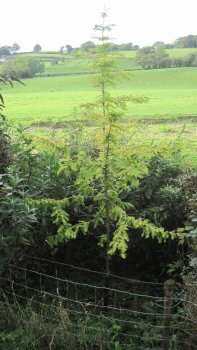 In 1998 I planted a giant redwood with a height of 1,65 m, todays height is almost 9m. There are some nice giant redwoods in germany, planted around 1860, shortly after their discovery, and grown in the hothouses of the botanical garden in Stuttgart, (not far from where I live). More nice specimen one will find around lake Konstanz to the south. But England has much more specimen and a perfect climate for them to grow. After I saw the pics on your website I have to come back soon. I am interested in the giant redwood you sprouted from a twig. I recently spoke to someone who had done this with dawn redwood twigs, and I have also grown a coast redwood in this way, but giants are not known for being able to do this. Enjoy your return visit to England when you get the opportunity. I cut 3 twigs last May (twigs about 3/4 foot long with 1,5-2 inch long sharp cut) and just put them into a pot with peatmoss, which I kept moist. I didn't cared too much, the twigs stayed green till September then I repotted them. One of the twigs had grown a root 2/3 of a foot the other two had no roots. A guy from a nursery here recommended an algee powder if the twig doesn't sprout, but I didn't use it. Right now I'm not sure if the seedling makes it, I think it was a bit to cold or I overwatered it. If I sprout from seeds I use peatmoss and vermiculite(50/50). Sprouting rate from bought seeds 30-40%,from collected seeds in Germany ca.3%. The collected seeds from giant forest and mountain home (last October.) I just planted 2 weeks ago. Until they have sprouted I keep them in a sunny and warm place (like it is recommended in the growing instructions from the bought ones). If they start to grow I keep them shaded from strong sunlight. Giant Redwood I'm growing about 7 seedlings that I sowed in November '09. I'm not quite sure what they are (because I bought Giant and Coast redwood together...), I think they're Giant redwood, am I right? I send you some pictures that I made. Can you tell me some good advice for best growing? Especially for wintertime, in my area lower temperature is -5 °C. Thanks in advance. I am pleased to hear you have had success growing your redwoods. The photographs you sent show Giant Redwoods so you are right! Be careful not to over-water them, they don't like to be too soggy. It is best to keep them indoors for the first few winters, although they can go outdoors during the summer once they are around 10cm tall. They should cope with the cold winter, but when they are large enough to be outside in a pot during the winter it is a good idea to shelter them from the cold dry wind. You may notice that they turn a dark colour during the winter, but they should recover and green up in the spring. 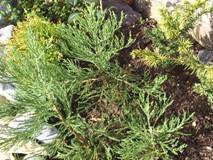 Coast Redwood I try to grow Sequoia Sempervirens from seeds collected next to an old tree in my town. The rate of germination if very low (2%). Up to this day, I have managed to make germinate about 10 seeds. All have two cotyledons. But the last germinated seed has three cotyledons! 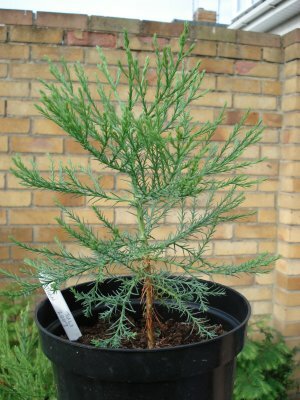 Have you ever seen such a character for a Sequoia Sempervirens seedling? 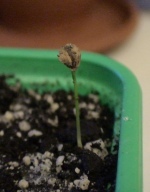 After how many months do the Sequoia Sempervirens eject its seed? 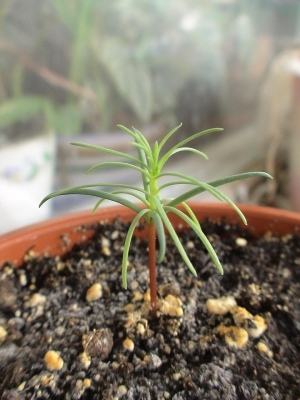 Indeed, after 3 months, none of my Sequoia Sempervirens has lost its seed (the cotyledons are still attached to the case). You are right the germination rate is very low for these seeds, I have an even lower success rate with the Sequoiadendron giganteum that I have gathered in the U.K. 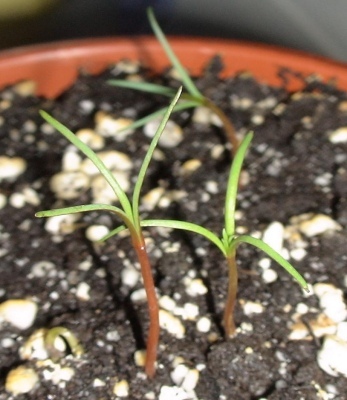 When growing the Sequoia sempervirens I've only ever had two cotyledons, however, when growing the Sequoiadendron giganteum from seed its standard number of cotyledons is four but every now and then I may get one with three, or five! As for the seed case staying attached to the seedling, I have this on mine occasionally, and if it stays on for longer than a few days I tend to try to remove it. I squeeze the case very gently from the edges (to try and break it open a little), then holding the leaves in the finger and thumb of one hand I try and pull it off the leaves with the thumb and forefinger of my other hand. If it is stuck fast I leave it a bit longer, but mostly it will pull off. I have found that if it stays on for too long the seedling may die, or it may simply attempt to continue with its next set of leaves. Sometimes the outer case comes off but it leaves behind a thin sheath surrounding the leaves. This is a bit more tricky and I have occasionally damaged some when I remove this bit. I believe you should be brave and it would only take the slightest touch to remove that case now! If you don't remove it, it will spoil the shape of the seedling and impede its growth a little, although in the longer term of course it won't matter. 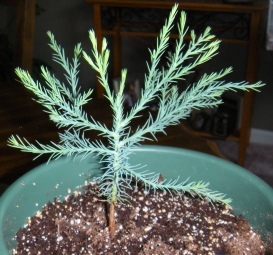 I have a Coast Redwood growing at home. It is 13 months old and doing well after a couple of months recently where I thought it was dying. I look after it well and found that misting it two or three times a day helps. It is in a pot and eventually I aim to pass it on to a stately home or some such place where it can be planted in the grounds and looked after. It now looks like I have a new seedling growing too. 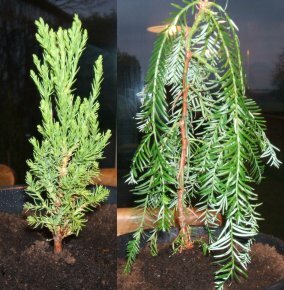 Thanks for the photo of your coast redwood, it appears to be doing very well and I hope your new seedling continues to make progress. 1. The tree is getting too much light. But... the lights are compact fluorescent, so although bright, they do not get hot. 2. Though I haven't fertilized it in over a month, I may have applied too much. However, after this initial application, the tree responded positively and new shoots grew. But, I tested the NPK with one of those cheap little test kits, and the results showed that there are very high levels of Phosphorus. The Nitrogen and Potassium levels were good. What do you think I should do? I could re-pot it in a larger pot with better soil. Would that shock it too much? Should it be outside? It is winter, but I live in Portland, Oregon. Here it is usually above freezing and rains almost every day. Or maybe the tree is fine and will perk up on it's own in the Spring? Also, I tested the pH, and that seems fine. I added some lime juice, and the pH of the soil varies between 5.3 and 6.5 -- similar to the soil in the Redwoods' natural environment. 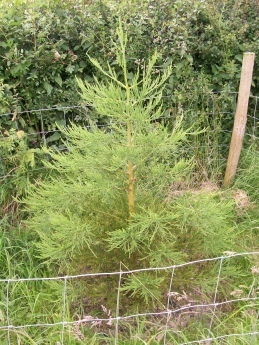 Thanks for the photographs of your sapling. It is possible you have applied a little too much fertiliser but I believe it is more likely the change of colour is a normal phenomenon in young saplings of this type over their first few winters. I have kept saplings of that size outside during the winter months (we have snow/frost/wind) and they have turned various shades of brown and purple but all have recovered in the warmer weather. I have always believed this was the effects of cold winds but as yours is growing inside perhaps this is not the case. If I were you I would not bring your tree inside next winter, especially as your temperatures are always above freezing. It will love the rain and acclimatise itself. I hope I am correct and that this sets your mind at rest and your sapling "greens up" again in the spring. Please let me know how it fares. 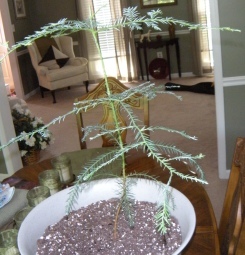 Nicholas sent an update in November 2011: I emailed you back in January about my Redwood (named Og). It was slightly browning, and I was concerned that it was dying. It actually got much worse, and became mostly yellow/brown. However, when the weather warmed up and it got sunny (in June), it became a lush dark green. Today I took a picture of it. It has grown quite a bit over the summer, and is quite healthy. It is starting to get less green. 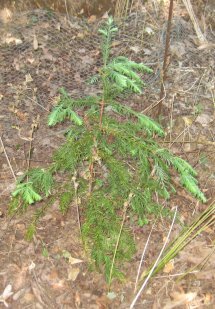 Apparently, according to a botanist friend of mine, this is normal for young Sequoia sempervirens. I am very pleased to hear about your Redwood's recovery, and I am glad that your botanist friend (and your Redwood!) agreed with me that it was likely to be just normal occurrence rather than ill health. 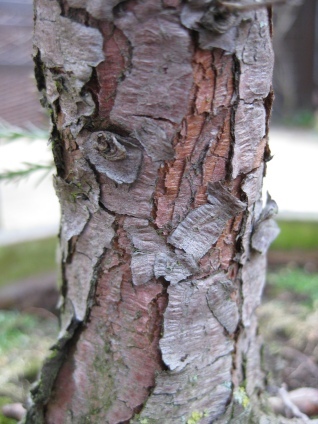 Alan wrote to Redwood World in 2010 about ten Dawn Redwood trees outside the Sainsbury’s store in The Quarry retail Park in Edinburgh having been chopped down to make way for an extension to the store and their subsequent replacements. Dawn Redwood 2007 He also mentioned that he had grown a Dawn Redwood from seed sown in 2004. 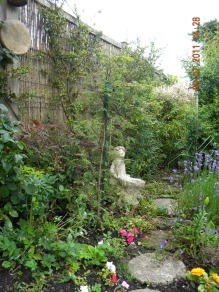 The photograph (on the left) was taken in 2007 prior to me planting it in the garden. The photographs on the right show the same tree four years after the one on the left was taken. I had to drape it with a sheet to see it in my wilderness of a back garden. 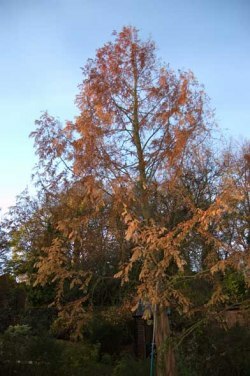 A few months later Alan sent a photograph of his Dawn Redwood in its Autumn colours. You can see it a little better against the other background bushes. It looks a nice healthy tree, I hope your Dawn Redwood continues to thrive. Dawn Redwood We have recently moved to this property and inherited this tree. Is it a Dawn Redwood? I'm told it is deciduous. Does it require any maintenance? A 'Tree and Garden' company just knocked on my door and insist the top needs thinning. I never trust this approach, but would be grateful of any info on the upkeep required. 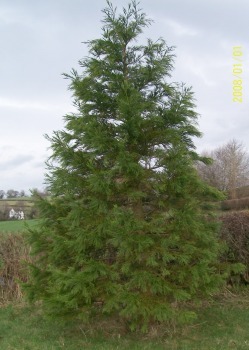 Firstly, yes it is definitely a Dawn Redwood. The close up of the foliage confirms the tree's identity, the opposing nature of the leaflets are the defining characteristic of this tree. I am always irked to hear about companies or individuals that try to take advantage of someone's lack of knowledge on the subject to make a quick buck. There is absolutely no reason why a tree such as this should be topped as they say, it will simply spoil the superb profile of such a singular tree. As for looking after your tree, they don't actually need any attention, although as is the case with any tree it is good to ensure that the ground around it does not become too hard and compacted, and if we do have a drought one year, it would always be wise (once again as with any tree) to play a hose around it now and then, or empty your bath water around it! It's good to know the tree needs no work! I really didn't want the shape of the tree altering. 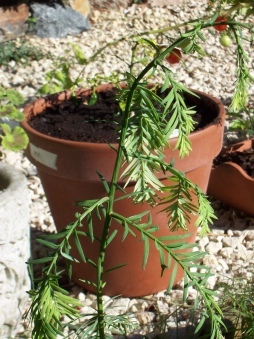 Dawn Redwood I have being growing redwood trees for a couple of years as Bonsai's but are not sure how to trim them have you any experience off this. The trees at present are approximately two feet tall and growing very well.Tops have been cropped off to stop them growing any higher. I have hardly any experience of bonsai, so I would recommend looking on a forum or perhaps searching for a bonsai club in your area. Well done for growing the trees in the first place, they are not the easiest of trees to germinate and maintain when young. Your trees look terrific, good luck with your bonsai project.